People: Hansen, Jeremy, Laliberte, Saint-Jacques, Chamberlin, Charyk, Maynard, Money, Tryggvason, Bondar, Garneau, Thirsk, Williams, Dave, MacLean, Hadfield, Chamitoff, Payette, McKay, Michael. Spacecraft: ExactView, Telesat, MAC-200, Multi-Mission Microsatellite Bus, Toronto GNB, Canadian PPS, HARP 5-1, HARP 5-3, HARP 7-1, HARP 7-2, Alouette, Isis, HS 333, CTS, Anik satellite, HS 376, ISS Space Station Remote Manipulator System, , FS-1300, HS 601, AS 5000, CTA, MicroSat-100, Radarsat, AS 2100, HS 702, Wild Fire, Canadian Arrow, Cubesat, Most, SCISAT, Spacebus 4000, Eurostar 3000, Can X, SSTL-150. Launch Vehicles: Deacon, Nike, Nike Ajax, Thor, R-7, Arcas, Black Brant IV, Black Brant, Black Brant I, Proton, Black Brant II, Skua, Martlet 1, Black Brant III, Martlet, Martlet 2, Black Brant VA, Martlet 3, Martlet 3A, Martlet 3B, Black Brant IVA, Black Brant IIB, 5 inch HARP Gun, Martlet 4, Black Brant VB, GLO-1B, Martlet 2G-1, Martlet 2G, 7 inch HARP Gun, Super Loki, Black Brant IIIB, Black Brant VI, Black Brant VC, Black Brant VII, Black Brant IVB, UR-100N, Black Brant 8B, Black Brant 8, Black Brant 8C, Ariane, Black Brant X, Black Brant IX, Black Brant IXB, Black Brant XB, Black Brant XII, Black Brant 9CM1, Black Brant XI, Black Brant 10CM1, Pegasus, Black Brant 9BM1, PSLV, Ariane 5, Excalibur Target System, Martlet 3D, Martlet 3E, Industrial Sounding System, Falcon 9, Black Brant V. Projects: Anik, M-SAT, STS. Launch Sites: Wallops Island, White Sands, Point Arguello, Cape Canaveral, Vandenberg, Baikonur, Poker Flat, Fort Churchill, Woomera, Plesetsk, Andoya, Barking Sands, Barbados site, Natal, Resolute Bay, Primrose Lake, Kourou, Cape Parry, East Quoddy, Hall Beach, Sriharikota, Gillam, Chilca, Red Lake, Southend, Cold Lake, Dombarovskiy. Stages: Martlet 4L-3, Martlet 4L-2, HARP Gun, Martlet 3-1, 23KS20000, HARP-1, Martlet 2-1, Martlet 2G1-1, Martlet 2G1-2, Martlet 4-1, Martlet 4-2, Martlet 4-3, Nihka, 9KS11000, 12KS10000, 15KS25000, 26KS20000, 9KS1660, BB7, Martlet 3E stage, Oriole. Agency: DND, ILS, SIS, NASA, USN, USAF, BRL, Sandia, CARDE, DRTE, DR.
1915 May 23 - . Birth of James A Chamberlin - . Nation: Canada. Related Persons: Chamberlin. Canadian-American engineer. Lead at Avro for fighters, 1945-1959. Lead positions at NASA, 1959-1970. Conceived modular design for Gemini and pushed its use for lunar mission. At McDonnell-Douglas 1970-1981; headed their shuttle bid..
1920 August 9 - . Birth of Joseph Vincent Charyk - . Nation: Canada, USA. Related Persons: Charyk. Canadian-American engineer. Chief Scientist, USAF, and First Director, NRO, 1961-1963. Founder of geosynchronous communications satellite industry. Headed Comsat as President, CEO, Chairman, 1963-1985..
1935 January 4 - . Birth of Kenneth Eric Money - . Nation: Canada. Related Persons: Money. Canadian physiologist payload specialist astronaut, 1983-1992..
1945 December 4 - . Birth of Roberta Lynn Bondar - . Nation: Canada. Related Persons: Bondar. Canadian physician payload specialist astronaut 1983-1992. Neurologist. First Canadian female astronaut. IML-1 payload specialist. 1 spaceflight, 8.1 days in space. Flew to orbit on STS-42 (1992)..
1949 February 23 - . Birth of Dr Joseph Jean-Pierre Marc Garneau - . Nation: Canada. Related Persons: Garneau. Canadian engineer mission specialist astronaut 1983-2001. First Canadian astronaut. 3 spaceflights, 29.1 days in space. Flew to orbit on STS-41G (1984), STS-77, STS-97..
1953 August 17 - . Birth of Dr Robert Brent Thirsk - . Nation: Canada. Related Persons: Thirsk. Canadian physician mission specialist astronaut 1983-2012. 2 spaceflights, 204.8 days in space. Flew to orbit on STS-78 (1996), Soyuz TMA-15..
1954 May 16 - . Birth of Dr Dafydd Rhys 'Dave' Williams - . Nation: Canada. Related Persons: Williams, Dave. Canadian physician mission specialist astronaut 1992-2008. 2 spaceflights, 28.7 days in space. Flew to orbit on STS-90 (1998), STS-118..
1954 December 14 - . Birth of Steven Glenwood MacLean - . Nation: Canada. Related Persons: MacLean. Canadian physicist mission specialist astronaut 1983-2008. Selected Aug 1996; he had been Payload Specialist on STS-52 Mission LAGEOS-2 (responsible for the Space Visions System). 2 spaceflights, 21.7 days in space. Flew to orbit on STS-52 (1992), STS-115. 1955 February 9 - . 21:06 GMT - . Launch Site: Fort Churchill. Launch Vehicle: Nike Ajax. Cold Weather Test - . Nation: Canada. Apogee: 10 km (6 mi). 1955 February 9 - . 21:19 GMT - . Launch Site: Fort Churchill. Launch Vehicle: Nike Ajax. 1955 March 2 - . 22:09 GMT - . Launch Site: Fort Churchill. Launch Vehicle: Nike Ajax. 1955 March 10 - . 19:42 GMT - . Launch Site: Fort Churchill. Launch Vehicle: Nike Ajax. 1955 March 10 - . 21:46 GMT - . Launch Site: Fort Churchill. Launch Vehicle: Nike Ajax. 1956 February 14 - . 18:07 GMT - . Launch Site: Fort Churchill. Launch Vehicle: Nike Ajax. 1956 February 22 - . 20:54 GMT - . Launch Site: Fort Churchill. Launch Vehicle: Nike Ajax. 1956 February 28 - . 22:16 GMT - . Launch Site: Fort Churchill. Launch Vehicle: Nike Ajax. 1956 February 28 - . 22:27 GMT - . Launch Site: Fort Churchill. Launch Vehicle: Nike Ajax. 1956 March 4 - . 13:58 GMT - . Launch Site: Fort Churchill. Launch Vehicle: Nike Ajax. 1956 March 4 - . 14:06 GMT - . Launch Site: Fort Churchill. Launch Vehicle: Nike Ajax. 1956 March 4 - . 14:48 GMT - . Launch Site: Fort Churchill. Launch Vehicle: Nike Ajax. 1956 March 4 - . 14:59 GMT - . Launch Site: Fort Churchill. Launch Vehicle: Nike Ajax. 1956 March 4 - . 15:43 GMT - . Launch Site: Fort Churchill. Launch Vehicle: Nike Ajax. 1956 March 4 - . 15:53 GMT - . Launch Site: Fort Churchill. Launch Vehicle: Nike Ajax. 1958 November 8 - . 01:53 GMT - . Launch Site: Fort Churchill. LV Family: Deacon. Launch Vehicle: Nike Cajun. Infrared airglow Aeronomy mission - . Nation: Canada. Agency: CARDE. Apogee: 139 km (86 mi). 1958 November 13 - . 08:59 GMT - . Launch Site: Fort Churchill. LV Family: Deacon. Launch Vehicle: Nike Cajun. Infrared airglow Aeronomy mission - . Nation: Canada. Agency: CARDE. Apogee: 142 km (88 mi). 1959 April 20 - . Canada-NASA sounding rocket agreement. - . Nation: Canada. NASA announced acceptance of proposals by the Canadian Defense Research Telecommunications Establishment for continuing joint rocket and satellite ionospheric experiments of a nonmilitary nature..
1959 August 19 - . Birth of Chris Austin Hadfield - . Nation: Canada. Related Persons: Hadfield. Canadian test pilot mission specialist astronaut 1992-2013. 3 spaceflights, 165.7 days in space. Flew to orbit on STS-74 (1995), STS-100, Soyuz TMA-07M..
1959 September 2 - . Birth of Guy Lalibert� - . Nation: Canada. Related Persons: Laliberte. Canadian space tourist, 2009. Founder of Cirque de Soleil. 1 spaceflight, 10.9 days in space. Flew to orbit on Soyuz TMA-16 (2009)..
1959 September 5 - . 15:27 GMT - . Launch Site: Fort Churchill. LV Family: Black Brant. Launch Vehicle: Black Brant I.
PTV-1 test - . Nation: Canada. Agency: CARDE. Apogee: 100 km (60 mi). 1959 September 5 - . 22:24 GMT - . Launch Site: Fort Churchill. LV Family: Black Brant. Launch Vehicle: Black Brant I. Test mission - . Nation: Canada. Agency: CARDE. Apogee: 90 km (55 mi). 1959 September 8 - . 15:14 GMT - . Launch Site: Fort Churchill. LV Family: Black Brant. Launch Vehicle: Black Brant I. Test mission - . Nation: Canada. Agency: CARDE. Apogee: 130 km (80 mi). 1959 September 10 - . 21:48 GMT - . Launch Site: Fort Churchill. LV Family: Black Brant. Launch Vehicle: Black Brant I. Test mission - . Nation: Canada. Agency: CARDE. Apogee: 127 km (78 mi). 1960 May 18 - . 21:04 GMT - . Launch Site: Fort Churchill. LV Family: Black Brant. Launch Vehicle: Black Brant I. FAILURE: Failure. Test mission - . Nation: Canada. Agency: CARDE. Apogee: 89 km (55 mi). 1960 May 24 - . 17:44 GMT - . Launch Site: Fort Churchill. LV Family: Black Brant. Launch Vehicle: Black Brant I. Test mission - . Nation: Canada. Agency: CARDE. Apogee: 171 km (106 mi). 1960 May 28 - . 18:27 GMT - . Launch Site: Fort Churchill. LV Family: Black Brant. Launch Vehicle: Black Brant I. Test mission - . Nation: Canada. Agency: CARDE. Apogee: 177 km (109 mi). 1960 September 23 - . 06:40 GMT - . Launch Site: Fort Churchill. LV Family: Black Brant. Launch Vehicle: Black Brant I.
NO2 seeding Aeronomy mission - . Nation: Canada. Agency: CARDE. Apogee: 100 km (60 mi). 1960 September 30 - . 06:17 GMT - . Launch Site: Fort Churchill. LV Family: Black Brant. Launch Vehicle: Black Brant I. 1960 October 8 - . 14:45 GMT - . Launch Site: Fort Churchill. LV Family: Black Brant. Launch Vehicle: Black Brant I.
DRTE-04 Type II aurora Aurora mission - . Nation: Canada. Agency: CARDE. Apogee: 116 km (72 mi). 1960 October 12 - . 16:37 GMT - . Launch Site: Fort Churchill. LV Family: Black Brant. Launch Vehicle: Black Brant II. Test mission - . Nation: Canada. Agency: CARDE. Apogee: 196 km (121 mi). 1960 October 12 - . 21:27 GMT - . Launch Site: Fort Churchill. LV Family: Black Brant. Launch Vehicle: Black Brant II. Test mission - . Nation: Canada. Agency: CARDE. Apogee: 216 km (134 mi). 1960 October 20 - . 19:50 GMT - . Launch Site: Fort Churchill. LV Family: Black Brant. Launch Vehicle: Black Brant I.
DRTE-03 Ionosphere / plasma mission - . Nation: Canada. Agency: DRTE. Apogee: 137 km (85 mi). 1960 October 28 - . 12:21 GMT - . Launch Site: Fort Churchill. LV Family: Black Brant. Launch Vehicle: Black Brant I.
DRTE-05 Ionosphere / plasma mission - . Nation: Canada. Agency: DRTE. Apogee: 150 km (90 mi). 1961 December 2 - . Launch Site: Wallops Island. Launch Complex: Wallops Island. Launch Vehicle: Black Brant. Black Brant launches from Wallops Island announced. - . Nation: Canada. Twelve Canadian Black Brant rockets for upper-atmosphere research were to be launched from NASA's Wallops Station, Virginia, as the Canadian Defence Research Board shifted the firing site from Fort Churchill because a fire largely destroyed the Canadian facilities. Capable of carrying a 150-pound payload to an altitude of 150 miles, Black Brants were to be fired from Wallops at the rate of two in December 1961, two in February 1962, six in April 1962, and two in May 1962. 1962 June - . LV Family: Martlet. Launch Vehicle: Martlet 1. Martlet One Flight Vehicle designed - . Nation: Canada. This was the first generation test vehicle for the HARP project..
1962 June 15 - . Launch Site: Wallops Island. LV Family: Black Brant. Launch Vehicle: Black Brant III. FAILURE: Failure. Test mission - . Nation: Canada. Agency: DRE. Apogee: 92 km (57 mi). Test mission - . Nation: Canada. Agency: DRE. Apogee: 98 km (60 mi). 1962 June 19 - . Launch Site: Wallops Island. LV Family: Black Brant. Launch Vehicle: Black Brant III. FAILURE: Failure. Test mission - . Nation: Canada. Agency: DRE. Apogee: 100 km (60 mi). 1962 June 28 - . Launch Site: Wallops Island. LV Family: Black Brant. Launch Vehicle: Black Brant III. FAILURE: Failure. Test mission - . Nation: Canada. Agency: DRE. Apogee: 13 km (8 mi). 1962 August 6 - . Birth of Gregory Errol Chamitoff - . Nation: Canada. Related Persons: Chamitoff. Canadian engineer mission specialist astronaut 1998-2013. 2 spaceflights, 198.8 days in space. Flew to orbit on STS-124 (2008), STS-134..
1962 September 29 - . 06:05 GMT - . Launch Site: Vandenberg. Launch Complex: Vandenberg SLC2E. LV Family: Thor. Launch Vehicle: Thor Agena B.
Alouette 1 - . Payload: Alouette 1 / TAVE. Mass: 145 kg (319 lb). Nation: Canada. Agency: Clemson. Class: Earth. Type: Magnetosphere satellite. Spacecraft: Alouette. USAF Sat Cat: 424 . COSPAR: 1962-B-Alpha-1. Apogee: 1,022 km (635 mi). Perigee: 987 km (613 mi). Inclination: 80.50 deg. Period: 105.20 min. Ionospheric research. Spacecraft engaged in research and exploration of the upper atmosphere or outer space (US Cat B). .
1962 December 13 - . Launch Site: Wallops Island. LV Family: Black Brant. Launch Vehicle: Black Brant III. Test mission - . Nation: Canada. Agency: DRE. Apogee: 90 km (55 mi). 1963 - . LV Family: Martlet. Launch Vehicle: Martlet 1. Martlet One Flight Vehicle designed. - . Nation: Canada. The Martlet One Flight Vehicle was designed in mid-1962 as a first generation test vehicle for the HARP project. The primary role of the Martlet One was to test the fundamental technologies for the concept. The main body of the vehicle was intended contain coloured chemicals for release during flight to produce a visible trail. This was to allow the wind and atmospheric conditions to be observed along the flight path. (primarily wind shear at altitudes near apogee). Ground observers were to determine the effect of high altitude winds on the chemical trail. The nose was designed to hold a small one watt radio telemetry transmitter and other electronic instruments. Only four Martlet Ones were manufactured. Two were flown during the initial test series and the remaining two were retired. The first Martlet One was launched on January 21, 1963. It was launched at an elevation of 80 degrees and flew for 145 seconds. During its flight it rose to an altitude of 26 km and landed 11 km down range. The second Martlet One was launched on February 1, 1963 and flew for 146 seconds. It rose to an altitude of 27 km and landed about 11 km down range. These two flights were sufficient to prove the launch concept. The initial test series also included several wooden test slugs. The Martlet 1 series was retired in favour of the much improved Martlet 2 family of vehicles. Also, the cost of installation of the gun and the ground support infrastructure left precious little funds for an extensive initial test series. Gun Launcher: 16.4 inch L45 smooth-bored gun. This was a standard 16 inch battleship gun which had the rifling bored out. Propellant load 330 kg cordite. 1963 - . Launch Site: Barbados Site. Launch Complex: Barbados HARP gun 16 inch. LV Family: Martlet. Launch Vehicle: Martlet 2. Test mission - . Nation: Canada. Agency: HARP. Apogee: 80 km (49 mi). 1963 January 21 - . LV Family: Martlet. Launch Vehicle: Martlet 1. Martlet 1 Shot 1 - . Nation: Canada. Agency: HARP. Apogee: 26 km (16 mi). The gun-launched rocket was shot at an elevation of 80 degrees and flew for 145 seconds. During its flight it rose to an altitude of 26 km and landed 11 km down range..
1963 February 1 - . LV Family: Martlet. Launch Vehicle: Martlet 1. Martlet 1 Shot 2 - . Nation: Canada. Agency: HARP. Apogee: 27 km (16 mi). The second Martlet One flew for 146 seconds. It rose to an altitude of 27 km and landed about 11 km down range. These two flights were sufficient to prove the launch concept. The initial test series also included several wooden test slugs..
1963 March 21 - . 03:53 GMT - . Launch Site: Fort Churchill. LV Family: Black Brant. Launch Vehicle: Black Brant I.
NO2 seeding Aeronomy mission - . Nation: Canada. Agency: CARDE. Apogee: 80 km (49 mi). 1963 March 25 - . 03:17 GMT - . Launch Site: Fort Churchill. LV Family: Black Brant. Launch Vehicle: Black Brant I. 1963 Apr - . Launch Site: Barbados Site. Launch Complex: Barbados HARP gun 16 inch. LV Family: Martlet. Launch Vehicle: Martlet 2. 2A II-1 - . Nation: Canada. Agency: HARP. Apogee: 80 km (49 mi). 1963 April 6 - . 04:03 GMT - . Launch Site: Fort Churchill. LV Family: Black Brant. Launch Vehicle: Black Brant I.
Ionosphere / fields Aurora / aeronomy / ionosphere mission - . Nation: Canada. Agency: NRCC. Apogee: 144 km (89 mi). 1963 April 6 - . 07:25 GMT - . Launch Site: Fort Churchill. LV Family: Black Brant. Launch Vehicle: Black Brant I.
Aurora / ionosphere / fields mission - . Nation: Canada. Agency: NRCC. Apogee: 140 km (80 mi). 1963 May 7 - . 20:30 GMT - . Launch Site: Fort Churchill. LV Family: Black Brant. Launch Vehicle: Black Brant II. Ionosphere mission - . Nation: Canada. Agency: NRCC. Apogee: 139 km (86 mi). Birth of Michael John McKay - . Nation: Canada. Related Persons: McKay, Michael. Canadian engineer payload specialist astronaut, 1992-1995..
1963 Jun - . Launch Site: Barbados Site. Launch Complex: Barbados HARP gun 16 inch. LV Family: Martlet. Launch Vehicle: Martlet 2. 2A II-3 - . Nation: Canada. Agency: HARP. Apogee: 80 km (49 mi). 1963 June 11 - . 05:06 GMT - . Launch Site: Fort Churchill. LV Family: Black Brant. Launch Vehicle: Black Brant II. Ionosphere mission - . Nation: Canada. Agency: NRCC. Apogee: 135 km (83 mi). 1963 June 18 - . Launch Site: Barbados Site. Launch Complex: Barbados HARP gun 16 inch. LV Family: Martlet. Launch Vehicle: Martlet 2. Test mission - . Nation: Canada. Agency: HARP. Apogee: 92 km (57 mi). 1963 June 24 - . 19:00 GMT - . Launch Site: Fort Churchill. LV Family: Black Brant. Launch Vehicle: Black Brant II. 1963 June 24 - . 23:00 GMT - . Launch Site: Fort Churchill. LV Family: Black Brant. Launch Vehicle: Black Brant II. Test mission - . Nation: Canada. Agency: CARDE. Apogee: 162 km (100 mi). 1963 August 28 - . Launch Site: Barbados Site. Launch Complex: Barbados HARP gun 16 inch. LV Family: Martlet. Launch Vehicle: Martlet 2. 2B III-2 - . Nation: Canada. Agency: HARP. Apogee: 80 km (49 mi). 2B III-1 - . Nation: Canada. Agency: HARP. Apogee: 80 km (49 mi). 1963 September 5 - . Launch Site: Barbados Site. Launch Complex: Barbados HARP gun 16 inch. LV Family: Martlet. Launch Vehicle: Martlet 3A. 3A III-2 - . Nation: Canada. Agency: HARP. Apogee: 80 km (49 mi). 3A III-3 - . Nation: Canada. Agency: HARP. Apogee: 80 km (49 mi). Test mission - . Nation: Canada. Agency: HARP. Apogee: 100 km (60 mi). The Martlet 3A gun-launched rocket program began in the spring of 1963 with test flights beginning in September. Early Martlet 3A test flights were less then successful. At launch loads of 5000-6000 g's the rocket motor fuel grain would fail.The Martlet 3A set a world record as the largest rocket launched from a gun. 3A III-4 - . Nation: Canada. Agency: HARP. Apogee: 80 km (49 mi). 1963 October 14 - . 05:34 GMT - . Launch Site: Fort Churchill. LV Family: Black Brant. Launch Vehicle: Black Brant II. Ionosphere / aurora mission - . Nation: Canada. Agency: DRTE. Apogee: 145 km (90 mi). 1963 October 18 - . 09:20 GMT - . Launch Site: Fort Churchill. LV Family: Black Brant. Launch Vehicle: Black Brant II. NO2 release Aeronomy mission - . Nation: Canada. Agency: CARDE. Apogee: 140 km (80 mi). 1963 October 20 - . Birth of Julie Payette - . Nation: Canada. Related Persons: Payette. Canadian engineer mission specialist astronaut 1992-2013. Engineer. Second Canadian female astronaut. 2 spaceflights, 25.5 days in space. Flew to orbit on STS-96 (1999), STS-127..
1963 October 26 - . 02:00 GMT - . Launch Site: Fort Churchill. LV Family: Black Brant. Launch Vehicle: Black Brant II. 1963 October 29 - . 02:53 GMT - . Launch Site: Fort Churchill. LV Family: Black Brant. Launch Vehicle: Black Brant II. 1964 Jan - . Launch Site: Barbados Site. Launch Complex: Barbados HARP gun 16 inch. LV Family: Martlet. Launch Vehicle: Martlet 3A. 3A IV-5 - . Nation: Canada. Agency: HARP. Apogee: 80 km (49 mi). 3A IV-2 - . Nation: Canada. Agency: HARP. Apogee: 80 km (49 mi). 3A IV-3 - . Nation: Canada. Agency: HARP. Apogee: 80 km (49 mi). 1964 Jan - . Launch Site: Barbados Site. Launch Complex: Barbados HARP gun 16 inch. LV Family: Martlet. Launch Vehicle: Martlet 2. 2A IV-4 - . Nation: Canada. Agency: HARP. Apogee: 80 km (49 mi). 3A IV-1 - . Nation: Canada. Agency: HARP. Apogee: 80 km (49 mi). 3A IV-6 - . Nation: Canada. Agency: HARP. Apogee: 80 km (49 mi). 3A IV-4 - . Nation: Canada. Agency: HARP. Apogee: 80 km (49 mi). 2A IV-3 - . Nation: Canada. Agency: HARP. Apogee: 80 km (49 mi). 2A IV-9 - . Nation: Canada. Agency: HARP. Apogee: 80 km (49 mi). 2A IV-8 - . Nation: Canada. Agency: HARP. Apogee: 80 km (49 mi). 2A IV-6 - . Nation: Canada. Agency: HARP. Apogee: 80 km (49 mi). 2A IV-2 - . Nation: Canada. Agency: HARP. Apogee: 80 km (49 mi). 2A IV-5 - . Nation: Canada. Agency: HARP. Apogee: 80 km (49 mi). 2A IV-7 - . Nation: Canada. Agency: HARP. Apogee: 80 km (49 mi). 1964 January 1 - . Launch Site: Barbados Site. Launch Complex: Barbados HARP gun 16 inch. LV Family: Martlet. Launch Vehicle: Martlet 2. 1964 January 9 - . 05:22 GMT - . Launch Site: Fort Churchill. LV Family: Black Brant. Launch Vehicle: Black Brant II. Auroral particles Aurora / ionosphere / micrometeorites mission - . Nation: Canada. Agency: NRCC. Apogee: 115 km (71 mi). 1964 January 14 - . 06:05 GMT - . Launch Site: Fort Churchill. LV Family: Black Brant. Launch Vehicle: Black Brant II. Auroral particles Aurora / ionosphere / micrometeorites mission - . Nation: Canada. Agency: NRCC. Apogee: 155 km (96 mi). 1964 January 15 - . Launch Site: Barbados Site. Launch Complex: Barbados HARP gun 16 inch. LV Family: Martlet. Launch Vehicle: Martlet 3A. 3A IV-7 - . Nation: Canada. Agency: HARP. Apogee: 80 km (49 mi). 1964 January 17 - . 07:21 GMT - . Launch Site: Fort Churchill. LV Family: Black Brant. Launch Vehicle: Black Brant II. Aurora / ionosphere / micrometeorites mission - . Nation: Canada. Agency: NRCC. Apogee: 75 km (46 mi). 1964 January 20 - . 18:00 GMT - . Launch Site: Fort Churchill. LV Family: Black Brant. Launch Vehicle: Black Brant II. Fin test - . Nation: Canada. Agency: CARDE. Apogee: 204 km (126 mi). 1964 January 20 - . 21:15 GMT - . Launch Site: Fort Churchill. LV Family: Black Brant. Launch Vehicle: Black Brant II. 1964 April 7 - . 05:29 GMT - . Launch Site: Fort Churchill. LV Family: Black Brant. Launch Vehicle: Black Brant II. 1964 April 8 - . 07:47 GMT - . Launch Site: Fort Churchill. LV Family: Black Brant. Launch Vehicle: Black Brant II. Auroral study Apr9? Aurora / aeronomy / ionosphere mission - . Nation: Canada. Agency: NRCC. Apogee: 154 km (95 mi). 1964 April 16 - . 07:16 GMT - . Launch Site: Fort Churchill. LV Family: Black Brant. Launch Vehicle: Black Brant II. Ionosphere / particles / micrometeorite mission - . Nation: Canada. Agency: NRCC. Apogee: 152 km (94 mi). 1964 April 17 - . 00:44 GMT - . Launch Site: Fort Churchill. LV Family: Black Brant. Launch Vehicle: Black Brant II. Daytime ne Test / ionosphere mission - . Nation: Canada. Agency: NRCC. Apogee: 172 km (106 mi). 1964 April 21 - . 23:56 GMT - . Launch Site: Fort Churchill. LV Family: Black Brant. Launch Vehicle: Black Brant III. Test mission - . Nation: Canada. Agency: NRCC. Apogee: 150 km (90 mi). 1964 June 23 - . Launch Site: Barbados Site. Launch Complex: Barbados HARP gun 16 inch. LV Family: Martlet. Launch Vehicle: Martlet 2. 2A V-1 - . Nation: Canada. Agency: HARP. Apogee: 80 km (49 mi). 1964 June 24 - . 20:34 GMT - . Launch Site: Fort Churchill. LV Family: Black Brant. Launch Vehicle: Black Brant IVA. Nation: Canada. Agency: CARDE. Apogee: 467 km (290 mi). 1964 June 25 - . Launch Site: Barbados Site. Launch Complex: Barbados HARP gun 16 inch. LV Family: Martlet. Launch Vehicle: Martlet 2. 2A V-2 - . Nation: Canada. Agency: HARP. Apogee: 80 km (49 mi). 2A V-3 - . Nation: Canada. Agency: HARP. Apogee: 80 km (49 mi). 1964 June 26 - . Launch Site: Barbados Site. Launch Complex: Barbados HARP gun 16 inch. LV Family: Martlet. Launch Vehicle: Martlet 2. 2A V-4 - . Nation: Canada. Agency: HARP. Apogee: 80 km (49 mi). 1964 Jul - . Launch Site: Barbados Site. Launch Complex: Barbados HARP gun 16 inch. LV Family: Martlet. Launch Vehicle: Martlet 3B. 3B VI-7 - . Nation: Canada. Agency: HARP. Apogee: 80 km (49 mi). 3B VI-5 - . Nation: Canada. Agency: HARP. Apogee: 80 km (49 mi). 3B VI-9 - . Nation: Canada. Agency: HARP. Apogee: 80 km (49 mi). 3B VI-8 - . Nation: Canada. Agency: HARP. Apogee: 80 km (49 mi). 1964 Jul - . Launch Site: Barbados Site. Launch Complex: Barbados HARP gun 16 inch. LV Family: Martlet. Launch Vehicle: Martlet 2. 2A VI-12 - . Nation: Canada. Agency: HARP. Apogee: 80 km (49 mi). 2A VI-20 - . Nation: Canada. Agency: HARP. Apogee: 80 km (49 mi). 3B VI-6 - . Nation: Canada. Agency: HARP. Apogee: 80 km (49 mi). 2A VI-8 - . Nation: Canada. Agency: HARP. Apogee: 80 km (49 mi). 2A VI-18 - . Nation: Canada. Agency: HARP. Apogee: 80 km (49 mi). 2A VI-5 - . Nation: Canada. Agency: HARP. Apogee: 80 km (49 mi). 2A VI-14 - . Nation: Canada. Agency: HARP. Apogee: 80 km (49 mi). 2A VI-15 - . Nation: Canada. Agency: HARP. Apogee: 80 km (49 mi). 2A VI-4 - . Nation: Canada. Agency: HARP. Apogee: 80 km (49 mi). 2A VI-19 - . Nation: Canada. Agency: HARP. Apogee: 80 km (49 mi). 2A VI-7 - . Nation: Canada. Agency: HARP. Apogee: 80 km (49 mi). 2A VI-9 - . Nation: Canada. Agency: HARP. Apogee: 80 km (49 mi). 2A VI-10 - . Nation: Canada. Agency: HARP. Apogee: 80 km (49 mi). 2A VI-11 - . Nation: Canada. Agency: HARP. Apogee: 80 km (49 mi). 2A VI-17 - . Nation: Canada. Agency: HARP. Apogee: 80 km (49 mi). 2A VI-13 - . Nation: Canada. Agency: HARP. Apogee: 80 km (49 mi). 2A VI-16 - . Nation: Canada. Agency: HARP. Apogee: 80 km (49 mi). 2A VI-6 - . Nation: Canada. Agency: HARP. Apogee: 80 km (49 mi). 1964 July 2 - . 21:00 GMT - . Launch Site: Fort Churchill. LV Family: Black Brant. Launch Vehicle: Black Brant IVA. FAILURE: Failure. Test mission - . Nation: Canada. Agency: CARDE. Apogee: 1.00 km (0.60 mi). 1964 July 6 - . Launch Site: Barbados Site. Launch Complex: Barbados HARP gun 16 inch. LV Family: Martlet. Launch Vehicle: Martlet 2. 2A VI-1 - . Nation: Canada. Agency: HARP. Apogee: 80 km (49 mi). 1964 July 7 - . 23:02 GMT - . Launch Site: Barbados Site. Launch Complex: Barbados HARP gun 16 inch. LV Family: Martlet. Launch Vehicle: Martlet 2. 2A VI-2 IRIS - . Nation: Canada. Agency: HARP. Apogee: 109 km (67 mi). 1964 July 8 - . 01:10 GMT - . Launch Site: Barbados Site. Launch Complex: Barbados HARP gun 16 inch. LV Family: Martlet. Launch Vehicle: Martlet 2. 2A VI-3 JANET - . Nation: Canada. Agency: HARP. Apogee: 95 km (59 mi). 1964 July 22 - . 23:00 GMT - . Launch Site: Barbados Site. Launch Complex: Barbados HARP gun 16 inch. LV Family: Martlet. Launch Vehicle: Martlet 2. 2A VI-21 SHARON - . Nation: Canada. Agency: HARP. Apogee: 98 km (60 mi). 1964 July 23 - . Launch Site: Barbados Site. Launch Complex: Barbados HARP gun 16 inch. LV Family: Martlet. Launch Vehicle: Martlet 3B. 3B VI-3 - . Nation: Canada. Agency: HARP. Apogee: 80 km (49 mi). 1964 July 23 - . Launch Site: Barbados Site. Launch Complex: Barbados HARP gun 16 inch. LV Family: Martlet. Launch Vehicle: Martlet 2. 2A VI-22 - . Nation: Canada. Agency: HARP. Apogee: 80 km (49 mi). 3B VI-1 - . Nation: Canada. Agency: HARP. Apogee: 80 km (49 mi). 3B VI-2 - . Nation: Canada. Agency: HARP. Apogee: 80 km (49 mi). 1964 July 24 - . 23:45 GMT - . Launch Site: Barbados Site. Launch Complex: Barbados HARP gun 16 inch. LV Family: Martlet. Launch Vehicle: Martlet 2. 2A VI-23 QUEENIE - . Nation: Canada. Agency: HARP. Apogee: 96 km (59 mi). 1964 July 25 - . Launch Site: Barbados Site. Launch Complex: Barbados HARP gun 16 inch. LV Family: Martlet. Launch Vehicle: Martlet 3B. 3B VI-10 - . Nation: Canada. Agency: HARP. Apogee: 80 km (49 mi). Last test flight of the Martlet 3B. Thereafter no further development work was performed by HARP on sub-calibre gun-launched rocket vehicles..
1964 September 8 - . Launch Site: Barbados Site. Launch Complex: Barbados HARP gun 16 inch. LV Family: Martlet. Launch Vehicle: Martlet 3B. 3B VII-1 - . Nation: Canada. Agency: HARP. Apogee: 80 km (49 mi). 3B VII-2 - . Nation: Canada. Agency: HARP. Apogee: 80 km (49 mi). 1964 September 8 - . 03:43 GMT - . Launch Site: Fort Churchill. LV Family: Black Brant. Launch Vehicle: Black Brant II. FAILURE: Failure. Ionosphere mission - . Nation: Canada. Agency: NRCC. Apogee: 20 km (12 mi). 1964 September 9 - . Launch Site: Barbados Site. Launch Complex: Barbados HARP gun 16 inch. LV Family: Martlet. Launch Vehicle: Martlet 3B. 3B VII-4 - . Nation: Canada. Agency: HARP. Apogee: 80 km (49 mi). 3B VII-3 - . Nation: Canada. Agency: HARP. Apogee: 80 km (49 mi). 1964 September 15 - . 06:59 GMT - . Launch Site: Fort Churchill. LV Family: Black Brant. Launch Vehicle: Black Brant II. Ionosphere mission - . Nation: Canada. Agency: NRCC. Apogee: 166 km (103 mi). 1964 October 6 - . 20:20 GMT - . Launch Site: Fort Churchill. LV Family: Black Brant. Launch Vehicle: Black Brant IIB. Test mission - . Nation: Canada. Agency: CARDE. Apogee: 211 km (131 mi). 1964 October 7 - . 18:35 GMT - . Launch Site: Fort Churchill. LV Family: Black Brant. Launch Vehicle: Black Brant IIB. Test mission - . Nation: Canada. Agency: CARDE. Apogee: 213 km (132 mi). 1964 November 27 - . 08:02 GMT - . Launch Site: Fort Churchill. LV Family: Black Brant. Launch Vehicle: Black Brant II. Test/Aeronomy/Ionosphere/Chemical release mission - . Nation: Canada. Agency: NRCC. Apogee: 170 km (100 mi). 1964 Dec - . Launch Site: Barbados Site. Launch Complex: Barbados HARP gun 16 inch. LV Family: Martlet. Launch Vehicle: Martlet 2. 2A IX-4 - . Nation: Canada. Agency: HARP. Apogee: 80 km (49 mi). 2C IX-2 - . Nation: Canada. Agency: HARP. Apogee: 80 km (49 mi). 2A IX-2 - . Nation: Canada. Agency: HARP. Apogee: 80 km (49 mi). 2A IX-3 - . Nation: Canada. Agency: HARP. Apogee: 80 km (49 mi). 2C IX-4 - . Nation: Canada. Agency: HARP. Apogee: 80 km (49 mi). 2C IX-3 - . Nation: Canada. Agency: HARP. Apogee: 80 km (49 mi). 2C IX-1 - . Nation: Canada. Agency: HARP. Apogee: 80 km (49 mi). 1964 Dec - . Launch Site: Barbados Site. Launch Complex: Barbados HARP gun 16 inch. LV Family: Martlet. Launch Vehicle: Martlet 3B. 3B IX-2 - . Nation: Canada. Agency: HARP. Apogee: 80 km (49 mi). 3B IX-1 - . Nation: Canada. Agency: HARP. Apogee: 80 km (49 mi). 1964 December 8 - . Launch Site: Barbados Site. Launch Complex: Barbados HARP gun 16 inch. LV Family: Martlet. Launch Vehicle: Martlet 2. 2A IX-1 - . Nation: Canada. Agency: HARP. Apogee: 80 km (49 mi). 1964 December 14 - . Launch Site: Barbados Site. Launch Complex: Barbados HARP gun 16 inch. LV Family: Martlet. Launch Vehicle: Martlet 3B. 3B IX-3 - . Nation: Canada. Agency: HARP. Apogee: 80 km (49 mi). 1965 January 22 - . 21:46 GMT - . Launch Site: Fort Churchill. LV Family: Black Brant. Launch Vehicle: Black Brant IVA. Test mission - . Nation: Canada. Agency: CARDE. Apogee: 670 km (410 mi). 1965 January 23 - . 18:15 GMT - . Launch Site: Fort Churchill. LV Family: Black Brant. Launch Vehicle: Black Brant IVA. Test mission - . Nation: Canada. Agency: CARDE. Apogee: 735 km (456 mi). 1965 January 25 - . 16:00 GMT - . Launch Site: Fort Churchill. LV Family: Black Brant. Launch Vehicle: Black Brant IIB. Test mission - . Nation: Canada. Agency: NRCC. Apogee: 230 km (140 mi). 1965 January 25 - . 20:53 GMT - . Launch Site: Fort Churchill. LV Family: Black Brant. Launch Vehicle: Black Brant IIB. FAILURE: Failure. Test mission - . Nation: Canada. Agency: NRCC. Apogee: 20 km (12 mi). 1965 March - . LV Family: Martlet. Launch Vehicle: Martlet 4. Martlet 4 orbital gun-launched rocket design. - . Nation: Canada. It was not until 1964, when agreements between the Canadian and the US governments permitted stable funding over the following three years, that HARP was able to seriously consider an orbital program. The Martlet 4 program began in the spring of 1965 with extensive parametric studies which showed that meaningful payloads could be launched into low Earth orbit from the 16 inch L86 HARP gun on the Barbados flight range using a full bore, 3 stage rocket vehicle. 1965 March 17 - . 21:30 GMT - . Launch Site: Fort Churchill. LV Family: Black Brant. Launch Vehicle: Black Brant II. Aeronomy mission - . Nation: Canada. Agency: NRCC. Apogee: 153 km (95 mi). 1965 March 19 - . 06:24 GMT - . Launch Site: Fort Churchill. LV Family: Black Brant. Launch Vehicle: Black Brant II. Fields mission - . Nation: Canada. Agency: NRCC. Apogee: 168 km (104 mi). 1965 March 23 - . Launch Site: Barbados Site. Launch Complex: Barbados HARP gun 16 inch. LV Family: Martlet. Launch Vehicle: Martlet 2. 2A X-2 - . Nation: Canada. Agency: HARP. Apogee: 80 km (49 mi). 2A X-1 - . Nation: Canada. Agency: HARP. Apogee: 80 km (49 mi). 1965 March 24 - . Launch Site: Barbados Site. Launch Complex: Barbados HARP gun 16 inch. LV Family: Martlet. Launch Vehicle: Martlet 2. 2C X-3 - . Nation: Canada. Agency: HARP. Apogee: 80 km (49 mi). 2C X-2 - . Nation: Canada. Agency: HARP. Apogee: 80 km (49 mi). 2C X-1 - . Nation: Canada. Agency: HARP. Apogee: 80 km (49 mi). 1965 March 24 - . 01:24 GMT - . Launch Site: Barbados Site. Launch Complex: Barbados HARP gun 16 inch. LV Family: Martlet. Launch Vehicle: Martlet 2. 2A X-3 LUPACA - . Nation: Canada. Agency: HARP. Apogee: 114 km (70 mi). 1965 March 24 - . 05:03 GMT - . Launch Site: Barbados Site. Launch Complex: Barbados HARP gun 16 inch. LV Family: Martlet. Launch Vehicle: Martlet 2. 2A X-4 MIAMI - . Nation: Canada. Agency: HARP. Apogee: 110 km (60 mi). 1965 March 24 - . 06:40 GMT - . Launch Site: Fort Churchill. LV Family: Black Brant. Launch Vehicle: Black Brant II. Fields mission (date may be 23 March) - . Nation: Canada. Agency: NRCC. Apogee: 166 km (103 mi). 1965 March 25 - . Launch Site: Barbados Site. Launch Complex: Barbados HARP gun 16 inch. LV Family: Martlet. Launch Vehicle: Martlet 3B. 3B X-1 - . Nation: Canada. Agency: HARP. Apogee: 80 km (49 mi). 3B X-2 - . Nation: Canada. Agency: HARP. Apogee: 80 km (49 mi). 1965 March 25 - . Launch Site: Barbados Site. Launch Complex: Barbados HARP gun 16 inch. LV Family: Martlet. Launch Vehicle: Martlet 2. 2D X-1 - . Nation: Canada. Agency: HARP. Apogee: 80 km (49 mi). 1965 March 25 - . 05:34 GMT - . Launch Site: Fort Churchill. LV Family: Black Brant. Launch Vehicle: Black Brant II. or Mar 24 Ionosphere / micrometeorite mission - . Nation: Canada. Agency: NRCC. Apogee: 155 km (96 mi). 1965 March 27 - . 06:20 GMT - . Launch Site: Barbados Site. Launch Complex: Barbados HARP gun 16 inch. LV Family: Martlet. Launch Vehicle: Martlet 2. 2C X-4 NOOTKA - . Nation: Canada. Agency: HARP. Apogee: 111 km (68 mi). 1965 March 29 - . Launch Site: Barbados Site. Launch Complex: Barbados HARP gun 16 inch. LV Family: Martlet. Launch Vehicle: Martlet 3B. 3B X-3 - . Nation: Canada. Agency: HARP. Apogee: 80 km (49 mi). 1965 March 29 - . 00:02 GMT - . Launch Site: Barbados Site. Launch Complex: Barbados HARP gun 16 inch. LV Family: Martlet. Launch Vehicle: Martlet 2. 2C X-5 OTTAWA - . Nation: Canada. Agency: HARP. Apogee: 119 km (73 mi). 1965 March 29 - . 02:20 GMT - . Launch Site: Barbados Site. Launch Complex: Barbados HARP gun 16 inch. LV Family: Martlet. Launch Vehicle: Martlet 2. 2C X-6 PUEBLO - . Nation: Canada. Agency: HARP. Apogee: 117 km (72 mi). 1965 April 22 - . 05:14 GMT - . Launch Site: Fort Churchill. LV Family: Black Brant. Launch Vehicle: Black Brant III. Aurora / ionosphere mission Aurora / ionosphere mission - . Nation: Canada. Agency: NRCC. Apogee: 136 km (84 mi). 1965 May 27 - . 23:56 GMT - . Launch Site: Fort Churchill. LV Family: Black Brant. Launch Vehicle: Black Brant II. FAILURE: Failure. Ionosphere mission - . Nation: Canada. Agency: NRCC. Apogee: 27 km (16 mi). 1965 May 31 - . 16:47 GMT - . Launch Site: Barbados Site. Launch Complex: Barbados HARP gun 16 inch. LV Family: Martlet. Launch Vehicle: Martlet 2. 2A XI-1 APPIUS - . Nation: Canada. Agency: HARP. Apogee: 84 km (52 mi). 1965 June 2 - . 14:19 GMT - . Launch Site: Fort Churchill. LV Family: Black Brant. Launch Vehicle: Black Brant II. Aurora / ionosphere mission Aurora / ionosphere mission - . Nation: Canada. Agency: NRCC. Apogee: 150 km (90 mi). 1965 June 2 - . 18:15 GMT - . Launch Site: Barbados Site. Launch Complex: Barbados HARP gun 16 inch. LV Family: Martlet. Launch Vehicle: Martlet 2. 2A XI-2 RUFUS - . Nation: Canada. Agency: HARP. Apogee: 79 km (49 mi). 1965 June 3 - . 17:32 GMT - . Launch Site: Barbados Site. Launch Complex: Barbados HARP gun 16 inch. LV Family: Martlet. Launch Vehicle: Martlet 3B. 3B XI-1 DEVILS - . Nation: Canada. Agency: HARP. Apogee: 1.00 km (0.60 mi). 1965 June 3 - . 20:54 GMT - . Launch Site: Barbados Site. Launch Complex: Barbados HARP gun 16 inch. LV Family: Martlet. Launch Vehicle: Martlet 2C. Ionosphere mission - . Nation: Canada. Agency: HARP. Apogee: 105 km (65 mi). 1965 June 3 - . 23:57 GMT - . Launch Site: Barbados Site. Launch Complex: Barbados HARP gun 16 inch. LV Family: Martlet. Launch Vehicle: Martlet 2. 2C XI-2 MARIUS - . Nation: Canada. Agency: HARP. Apogee: 111 km (68 mi). 1965 June 4 - . 02:41 GMT - . Launch Site: Barbados Site. Launch Complex: Barbados HARP gun 16 inch. LV Family: Martlet. Launch Vehicle: Martlet 2. 2C XI-5 NERO - . Nation: Canada. Agency: HARP. Apogee: 94 km (58 mi). 1965 June 4 - . 05:34 GMT - . Launch Site: Barbados Site. Launch Complex: Barbados HARP gun 16 inch. LV Family: Martlet. Launch Vehicle: Martlet 2. 2C XI-6 ELAGABULUS - . Nation: Canada. Agency: HARP. Apogee: 119 km (73 mi). 1965 June 4 - . 07:17 GMT - . Launch Site: Barbados Site. Launch Complex: Barbados HARP gun 16 inch. LV Family: Martlet. Launch Vehicle: Martlet 2. 2C XI-7 FABIUS - . Nation: Canada. Agency: HARP. Apogee: 110 km (60 mi). 1965 June 5 - . 17:22 GMT - . Launch Site: Barbados Site. Launch Complex: Barbados HARP gun 16 inch. LV Family: Martlet. Launch Vehicle: Martlet 2. 2A XI-3 SPARTA - . Nation: Canada. Agency: HARP. Apogee: 76 km (47 mi). 1965 June 5 - . 20:20 GMT - . Launch Site: Barbados Site. Launch Complex: Barbados HARP gun 16 inch. LV Family: Martlet. Launch Vehicle: Martlet 2. Ionosphere mission - . Nation: Canada. Agency: HARP. Apogee: 120 km (70 mi). 1965 June 5 - . 22:43 GMT - . Launch Site: Barbados Site. Launch Complex: Barbados HARP gun 16 inch. LV Family: Martlet. Launch Vehicle: Martlet 2. Ionosphere mission - . Nation: Canada. Agency: HARP. Apogee: 117 km (72 mi). 1965 June 7 - . 16:11 GMT - . Launch Site: Barbados Site. Launch Complex: Barbados HARP gun 16 inch. LV Family: Martlet. Launch Vehicle: Martlet 3B. 3B XI-2 EAGLE - . Nation: Canada. Agency: HARP. Apogee: 1.00 km (0.60 mi). 1965 June 9 - . 22:51 GMT - . Launch Site: Barbados Site. Launch Complex: Barbados HARP gun 16 inch. LV Family: Martlet. Launch Vehicle: Martlet 2. 2C XI-12 LUCRETIA - . Nation: Canada. Agency: HARP. Apogee: 118 km (73 mi). 1965 June 10 - . 01:57 GMT - . Launch Site: Barbados Site. Launch Complex: Barbados HARP gun 16 inch. LV Family: Martlet. Launch Vehicle: Martlet 2. 2C XI-8 OVID - . Nation: Canada. Agency: HARP. Apogee: 105 km (65 mi). 1965 June 10 - . 03:58 GMT - . Launch Site: Barbados Site. Launch Complex: Barbados HARP gun 16 inch. LV Family: Martlet. Launch Vehicle: Martlet 2. 2C XI-9 CICERO - . Nation: Canada. Agency: HARP. Apogee: 107 km (66 mi). 1965 June 10 - . 06:35 GMT - . Launch Site: Barbados Site. Launch Complex: Barbados HARP gun 16 inch. LV Family: Martlet. Launch Vehicle: Martlet 2. 2C XI-10 DIANA - . Nation: Canada. Agency: HARP. Apogee: 109 km (67 mi). 1965 June 11 - . 01:07 GMT - . Launch Site: Barbados Site. Launch Complex: Barbados HARP gun 16 inch. LV Family: Martlet. Launch Vehicle: Martlet 2. 2C XI-11 PLINY - . Nation: Canada. Agency: HARP. Apogee: 133 km (82 mi). 1965 June 12 - . 07:00 GMT - . Launch Site: Barbados Site. Launch Complex: Barbados HARP gun 16 inch. LV Family: Martlet. Launch Vehicle: Martlet 2. 2C XI-13 QUINTUS - . Nation: Canada. Agency: HARP. Apogee: 135 km (83 mi). 1965 June 12 - . 08:31 GMT - . Launch Site: Barbados Site. Launch Complex: Barbados HARP gun 16 inch. LV Family: Martlet. Launch Vehicle: Martlet 2. 2C XI-14 HADRIAN - . Nation: Canada. Agency: HARP. Apogee: 133 km (82 mi). 1965 June 12 - . 19:14 GMT - . Launch Site: Fort Churchill. LV Family: Black Brant. Launch Vehicle: Black Brant VB. Test mission - . Nation: Canada. Agency: Bristol. Apogee: 378 km (234 mi). 1965 June 18 - . 16:12 GMT - . Launch Site: Fort Churchill. LV Family: Black Brant. Launch Vehicle: Black Brant VB. Test mission - . Nation: Canada. Agency: Bristol. Apogee: 364 km (226 mi). 1965 July 1 - . Launch Site: Barbados Site. Launch Complex: Barbados HARP gun 16 inch. LV Family: Martlet. Launch Vehicle: Martlet 2. Ionosphere mission - . Nation: Canada. Agency: HARP. Apogee: 150 km (90 mi). 1965 August 4 - . Launch Site: Barbados Site. Launch Complex: Barbados HARP gun 16 inch. LV Family: Martlet. Launch Vehicle: Martlet 2. 2C XII-1 - . Nation: Canada. Agency: HARP. Apogee: 100 km (60 mi). 1965 August 6 - . 00:20 GMT - . Launch Site: Barbados Site. Launch Complex: Barbados HARP gun 16 inch. LV Family: Martlet. Launch Vehicle: Martlet 2. 2C XII-2 - . Nation: Canada. Agency: HARP. Apogee: 107 km (66 mi). 1965 August 6 - . 06:44 GMT - . Launch Site: Barbados Site. Launch Complex: Barbados HARP gun 16 inch. LV Family: Martlet. Launch Vehicle: Martlet 2. 2C XII-3 - . Nation: Canada. Agency: HARP. Apogee: 106 km (65 mi). 1965 Sep - . Launch Site: Barbados Site. Launch Complex: Barbados HARP gun 16 inch. LV Family: Martlet. Launch Vehicle: Martlet 2. 2C XIII-5 - . Nation: Canada. Agency: HARP. Apogee: 100 km (60 mi). 2C XIII-3 - . Nation: Canada. Agency: HARP. Apogee: 100 km (60 mi). 2C XIII-4 - . Nation: Canada. Agency: HARP. Apogee: 100 km (60 mi). 2A XIII-1 - . Nation: Canada. Agency: HARP. Apogee: 100 km (60 mi). 2C XIII-7 - . Nation: Canada. Agency: HARP. Apogee: 100 km (60 mi). 2C XIII-6 - . Nation: Canada. Agency: HARP. Apogee: 100 km (60 mi). 2C XIII-2 - . Nation: Canada. Agency: HARP. Apogee: 100 km (60 mi). 1965 September 14 - . Launch Site: Barbados Site. Launch Complex: Barbados HARP gun 16 inch. LV Family: Martlet. Launch Vehicle: Martlet 2. 2C XIII-1 - . Nation: Canada. Agency: HARP. Apogee: 100 km (60 mi). 1965 September 20 - . 23:30 GMT - . Launch Site: Barbados Site. Launch Complex: Barbados HARP gun 16 inch. LV Family: Martlet. Launch Vehicle: Martlet 2. 2C XIII-8 BELAIR - . Nation: Canada. Agency: HARP. Apogee: 132 km (82 mi). 1965 September 21 - . 00:52 GMT - . Launch Site: Barbados Site. Launch Complex: Barbados HARP gun 16 inch. LV Family: Martlet. Launch Vehicle: Martlet 2. 2C XIII-9 CONOWINGO - . Nation: Canada. Agency: HARP. Apogee: 136 km (84 mi). 1965 September 21 - . 04:24 GMT - . Launch Site: Barbados Site. Launch Complex: Barbados HARP gun 16 inch. LV Family: Martlet. Launch Vehicle: Martlet 2. 2C XIII-10 EDGEWOOD - . Nation: Canada. Agency: HARP. Apogee: 123 km (76 mi). 1965 September 21 - . 06:21 GMT - . Launch Site: Barbados Site. Launch Complex: Barbados HARP gun 16 inch. LV Family: Martlet. Launch Vehicle: Martlet 2. 2C XIII-11 FO. GREEN - . Nation: Canada. Agency: HARP. Apogee: 128 km (79 mi). 1965 September 21 - . 07:35 GMT - . Launch Site: Barbados Site. Launch Complex: Barbados HARP gun 16 inch. LV Family: Martlet. Launch Vehicle: Martlet 2. 2C XIII-12 GALENA - . Nation: Canada. Agency: HARP. Apogee: 138 km (85 mi). 1965 September 21 - . 09:00 GMT - . Launch Site: Barbados Site. Launch Complex: Barbados HARP gun 16 inch. LV Family: Martlet. Launch Vehicle: Martlet 2. Aeronomy mission 2C XIII-13 HAVRE DE - . Nation: Canada. Agency: HARP. Apogee: 123 km (76 mi). 1965 September 22 - . 23:24 GMT - . Launch Site: Barbados Site. Launch Complex: Barbados HARP gun 16 inch. LV Family: Martlet. Launch Vehicle: Martlet 2. 2C XIII-14 LINTHICUM - . Nation: Canada. Agency: HARP. Apogee: 127 km (78 mi). Aeronomy mission - . Nation: Canada. Agency: HARP. Apogee: 80 km (49 mi). 1965 September 23 - . 05:50 GMT - . Launch Site: Barbados Site. Launch Complex: Barbados HARP gun 16 inch. LV Family: Martlet. Launch Vehicle: Martlet 2. 2C XIII-15 MAGNOLIA - . Nation: Canada. Agency: HARP. Apogee: 126 km (78 mi). 1965 September 23 - . 07:15 GMT - . Launch Site: Barbados Site. Launch Complex: Barbados HARP gun 16 inch. LV Family: Martlet. Launch Vehicle: Martlet 2. 2C XIII-16 NANTICOKE - . Nation: Canada. Agency: HARP. Apogee: 133 km (82 mi). 1965 September 23 - . 08:07 GMT - . Launch Site: Barbados Site. Launch Complex: Barbados HARP gun 16 inch. LV Family: Martlet. Launch Vehicle: Martlet 2. 2C XIII-17 OLNEY - . Nation: Canada. Agency: HARP. Apogee: 126 km (78 mi). 1965 September 23 - . 09:05 GMT - . Launch Site: Barbados Site. Launch Complex: Barbados HARP gun 16 inch. LV Family: Martlet. Launch Vehicle: Martlet 2. 2C XIII-18 PERRYMAN - . Nation: Canada. Agency: HARP. Apogee: 124 km (77 mi). 1965 September 25 - . Launch Site: Barbados Site. Launch Complex: Barbados HARP gun 16 inch. LV Family: Martlet. Launch Vehicle: Martlet 2. 2A XIII-2 - . Nation: Canada. Agency: HARP. Apogee: 100 km (60 mi). 1965 November 15 - . 16:00 GMT - . Launch Site: Barbados Site. Launch Complex: Barbados HARP gun 16 inch. LV Family: Martlet. Launch Vehicle: Martlet 3B. 3B FOAM - . Nation: Canada. Agency: HARP. Apogee: 11 km (6 mi). 1965 November 15 - . 20:03 GMT - . Launch Site: Barbados Site. Launch Complex: Barbados HARP gun 16 inch. LV Family: Martlet. Launch Vehicle: Martlet 3B. 3B GOOSE - . Nation: Canada. Agency: HARP. Apogee: 10 km (6 mi). 1965 November 16 - . 17:18 GMT - . Launch Site: Barbados Site. Launch Complex: Barbados HARP gun 16 inch. LV Family: Martlet. Launch Vehicle: Martlet 2. 2C2 ZENMAC - . Nation: Canada. Agency: HARP. Apogee: 110 km (60 mi). 1965 November 16 - . 22:15 GMT - . Launch Site: Barbados Site. Launch Complex: Barbados HARP gun 16 inch. LV Family: Martlet. Launch Vehicle: Martlet 2. 2C3 CESIUM - . Nation: Canada. Agency: HARP. Apogee: 119 km (73 mi). 1965 November 17 - . 18:31 GMT - . Launch Site: Barbados Site. Launch Complex: Barbados HARP gun 16 inch. LV Family: Martlet. Launch Vehicle: Martlet 3B. 3B HAHA - . Nation: Canada. Agency: HARP. Apogee: 12 km (7 mi). 1965 November 17 - . 20:16 GMT - . Launch Site: Barbados Site. Launch Complex: Barbados HARP gun 16 inch. LV Family: Martlet. Launch Vehicle: Martlet 2. 2C3 BRIDGETOWN Chaff - . Nation: Canada. Agency: HARP. Apogee: 85 km (52 mi). 1965 November 17 - . 22:15 GMT - . Launch Site: Barbados Site. Launch Complex: Barbados HARP gun 16 inch. LV Family: Martlet. Launch Vehicle: Martlet 2. 2C2 CHRISTCHURCH - . Nation: Canada. Agency: HARP. Apogee: 120 km (70 mi). 1965 November 17 - . 23:34 GMT - . Launch Site: Barbados Site. Launch Complex: Barbados HARP gun 16 inch. LV Family: Martlet. Launch Vehicle: Martlet 2. 2C2 DOVER - . Nation: Canada. Agency: HARP. Apogee: 122 km (75 mi). 1965 November 18 - . 03:15 GMT - . Launch Site: Barbados Site. Launch Complex: Barbados HARP gun 16 inch. LV Family: Martlet. Launch Vehicle: Martlet 2. 2C2 FOULBAY - . Nation: Canada. Agency: HARP. Apogee: 123 km (76 mi). 1965 November 18 - . 04:45 GMT - . Launch Site: Barbados Site. Launch Complex: Barbados HARP gun 16 inch. LV Family: Martlet. Launch Vehicle: Martlet 2. 2C2 GUNHILL - . Nation: Canada. Agency: HARP. Apogee: 126 km (78 mi). 1965 November 18 - . 05:58 GMT - . Launch Site: Barbados Site. Launch Complex: Barbados HARP gun 16 inch. LV Family: Martlet. Launch Vehicle: Martlet 2. 2C2 HASTINGS - . Nation: Canada. Agency: HARP. Apogee: 32 km (19 mi). 1965 November 18 - . 07:30 GMT - . Launch Site: Barbados Site. Launch Complex: Barbados HARP gun 16 inch. LV Family: Martlet. Launch Vehicle: Martlet 2. 2C2 INDIAN GROUND - . Nation: Canada. Agency: HARP. Apogee: 122 km (75 mi). 1965 November 18 - . 09:08 GMT - . Launch Site: Barbados Site. Launch Complex: Barbados HARP gun 16 inch. LV Family: Martlet. Launch Vehicle: Martlet 2. 2C2 JAMESTOWN - . Nation: Canada. Agency: HARP. Apogee: 119 km (73 mi). 1965 November 20 - . 16:00 GMT - . Launch Site: Barbados Site. Launch Complex: Barbados HARP gun 16 inch. LV Family: Martlet. Launch Vehicle: Martlet 2. 2C2 WORTHING - . Nation: Canada. Agency: HARP. Apogee: 104 km (64 mi). 1965 November 21 - . 16:10 GMT - . Launch Site: Barbados Site. Launch Complex: Barbados HARP gun 16 inch. LV Family: Martlet. Launch Vehicle: Martlet 2. 2C2 VAUXHALL - . Nation: Canada. Agency: HARP. Apogee: 128 km (79 mi). 1965 November 22 - . 23:30 GMT - . Launch Site: Barbados Site. Launch Complex: Barbados HARP gun 16 inch. LV Family: Martlet. Launch Vehicle: Martlet 2. 2C2 NEEDHAM'S POINT - . Nation: Canada. Agency: USAF. Apogee: 133 km (82 mi). 1965 November 23 - . 00:55 GMT - . Launch Site: Barbados Site. Launch Complex: Barbados HARP gun 16 inch. LV Family: Martlet. Launch Vehicle: Martlet 2. 2C2 OLDBURY - . Nation: Canada. Agency: USAF. Apogee: 31 km (19 mi). 1965 November 29 - . 04:48 GMT - . Launch Site: Vandenberg. Launch Complex: Vandenberg SLC2E. LV Family: Thor. Launch Vehicle: Thor SLV-2 Agena B.
Alouette 2 - . Payload: Alouette 2 / Explorer 31. Mass: 145 kg (319 lb). Nation: Canada. Agency: DRTE. Class: Earth. Type: Magnetosphere satellite. Spacecraft: Alouette. USAF Sat Cat: 1804 . COSPAR: 1965-098A. Apogee: 2,666 km (1,656 mi). Perigee: 503 km (312 mi). Inclination: 79.80 deg. Period: 117.90 min. Ionospheric research; data correlated with Explorer 31. The double-launch project, known as ISIS-X was the first in a new co-operative NASA-Canadian Defense Research Board program for International Satellites for Ionospheric Studies. Alouette was in orbit with an apogee just over a kilometre lower than Explorer 31's and with a perigee of just more than a kilometre higher. The orbits were some 3000 km at apogee and 500 km at perigee. 1966 January 17 - . 20:21 GMT - . Launch Site: Barbados Site. Launch Complex: Barbados HARP gun 5 inch. Launch Vehicle: HARP 5-1. 1 - . Nation: Canada. Agency: HARP. Apogee: 67 km (41 mi). 1966 January 18 - . 14:11 GMT - . Launch Site: Barbados Site. Launch Complex: Barbados HARP gun 5 inch. Launch Vehicle: HARP 5-1. 2 - . Nation: Canada. Agency: HARP. Apogee: 69 km (42 mi). 1966 January 18 - . 19:21 GMT - . Launch Site: Barbados Site. Launch Complex: Barbados HARP gun 5 inch. Launch Vehicle: HARP 5-1. 3 - . Nation: Canada. Agency: HARP. Apogee: 68 km (42 mi). 1966 January 18 - . 20:07 GMT - . Launch Site: Barbados Site. Launch Complex: Barbados HARP gun 5 inch. Launch Vehicle: HARP 5-1. 4 - . Nation: Canada. Agency: HARP. Apogee: 67 km (41 mi). 1966 January 19 - . 15:00 GMT - . Launch Site: Barbados Site. Launch Complex: Barbados HARP gun 5 inch. Launch Vehicle: HARP 5-1. 5 - . Nation: Canada. Agency: HARP. Apogee: 67 km (41 mi). 1966 January 19 - . 18:45 GMT - . Launch Site: Barbados Site. Launch Complex: Barbados HARP gun 5 inch. Launch Vehicle: HARP 5-1. 6 - . Nation: Canada. Agency: HARP. Apogee: 65 km (40 mi). 1966 January 19 - . 19:57 GMT - . Launch Site: Barbados Site. Launch Complex: Barbados HARP gun 5 inch. Launch Vehicle: HARP 5-1. 7 - . Nation: Canada. Agency: HARP. Apogee: 65 km (40 mi). 1966 January 20 - . 16:07 GMT - . Launch Site: Barbados Site. Launch Complex: Barbados HARP gun 5 inch. Launch Vehicle: HARP 5-1. 8 - . Nation: Canada. Agency: HARP. Apogee: 61 km (37 mi). 1966 January 20 - . 19:25 GMT - . Launch Site: Barbados Site. Launch Complex: Barbados HARP gun 5 inch. Launch Vehicle: HARP 5-1. 9 - . Nation: Canada. Agency: HARP. Apogee: 72 km (44 mi). 1966 January 21 - . 16:02 GMT - . Launch Site: Barbados Site. Launch Complex: Barbados HARP gun 5 inch. Launch Vehicle: HARP 5-1. 10 - . Nation: Canada. Agency: HARP. Apogee: 66 km (41 mi). 1966 January 21 - . 19:50 GMT - . Launch Site: Barbados Site. Launch Complex: Barbados HARP gun 5 inch. Launch Vehicle: HARP 5-1. 11 - . Nation: Canada. Agency: HARP. Apogee: 64 km (39 mi). 1966 January 24 - . 16:00 GMT - . Launch Site: Barbados Site. Launch Complex: Barbados HARP gun 5 inch. Launch Vehicle: HARP 5-1. 12 - . Nation: Canada. Agency: HARP. Apogee: 61 km (37 mi). 1966 January 26 - . 16:10 GMT - . Launch Site: Barbados Site. Launch Complex: Barbados HARP gun 5 inch. Launch Vehicle: HARP 5-1. 13 - . Nation: Canada. Agency: HARP. Apogee: 64 km (39 mi). 1966 January 28 - . 16:00 GMT - . Launch Site: Barbados Site. Launch Complex: Barbados HARP gun 5 inch. Launch Vehicle: HARP 5-1. 14 - . Nation: Canada. Agency: HARP. Apogee: 64 km (39 mi). 1966 January 31 - . 16:40 GMT - . Launch Site: Barbados Site. Launch Complex: Barbados HARP gun 5 inch. Launch Vehicle: HARP 5-1. 15 - . Nation: Canada. Agency: HARP. Apogee: 67 km (41 mi). 1966 February 2 - . 16:00 GMT - . Launch Site: Barbados Site. Launch Complex: Barbados HARP gun 5 inch. Launch Vehicle: HARP 5-1. 17 - . Nation: Canada. Agency: HARP. Apogee: 57 km (35 mi). 1966 February 2 - . 17:35 GMT - . Launch Site: Barbados Site. Launch Complex: Barbados HARP gun 16 inch. LV Family: Martlet. Launch Vehicle: Martlet 2. Aeronomy mission - . Nation: Canada. Agency: HARP. Apogee: 53 km (32 mi). 1966 February 2 - . 19:35 GMT - . Launch Site: Barbados Site. Launch Complex: Barbados HARP gun 5 inch. Launch Vehicle: HARP 5-1. 16 - . Nation: Canada. Agency: HARP. Apogee: 60 km (37 mi). 1966 February 7 - . 16:00 GMT - . Launch Site: Barbados Site. Launch Complex: Barbados HARP gun 16 inch. LV Family: Martlet. Launch Vehicle: Martlet 2. Aeronomy mission - . Nation: Canada. Agency: HARP. Apogee: 46 km (28 mi). 1966 February 7 - . 16:00 GMT - . Launch Site: Barbados Site. Launch Complex: Barbados HARP gun 5 inch. Launch Vehicle: HARP 5-1. 18 - . Nation: Canada. Agency: HARP. Apogee: 64 km (39 mi). 1966 February 8 - . 18:16 GMT - . Launch Site: Wallops Island. Launch Vehicle: HARP 5-1. Aeronomy mission - . Nation: Canada. Agency: HARP. Apogee: 60 km (37 mi). 1966 February 8 - . 19:58 GMT - . Launch Site: Wallops Island. Launch Vehicle: HARP 5-1. 1966 February 9 - . 16:03 GMT - . Launch Site: Barbados Site. Launch Complex: Barbados HARP gun 5 inch. Launch Vehicle: HARP 5-1. 19 - . Nation: Canada. Agency: HARP. Apogee: 61 km (37 mi). 1966 February 11 - . 16:00 GMT - . Launch Site: Barbados Site. Launch Complex: Barbados HARP gun 5 inch. Launch Vehicle: HARP 5-1. 20 - . Nation: Canada. Agency: HARP. Apogee: 61 km (37 mi). 1966 February 11 - . 16:00 GMT - . Launch Site: Barbados Site. Launch Complex: Barbados HARP gun 16 inch. LV Family: Martlet. Launch Vehicle: Martlet 2. 1966 February 16 - . 16:00 GMT - . Launch Site: Barbados Site. Launch Complex: Barbados HARP gun 5 inch. Launch Vehicle: HARP 5-1. 21 - . Nation: Canada. Agency: HARP. Apogee: 58 km (36 mi). 1966 February 16 - . 17:00 GMT - . Launch Site: Barbados Site. Launch Complex: Barbados HARP gun 16 inch. LV Family: Martlet. Launch Vehicle: Martlet 2. 1966 February 17 - . 17:36 GMT - . Launch Site: Barbados Site. Launch Complex: Barbados HARP gun 5 inch. Launch Vehicle: HARP 5-1. 22 - . Nation: Canada. Agency: HARP. Apogee: 61 km (37 mi). 1966 February 18 - . 01:03 GMT - . Launch Site: Barbados Site. Launch Complex: Barbados HARP gun 16 inch. LV Family: Martlet. Launch Vehicle: Martlet 2. B-43 INAUGUA - . Nation: Canada. Agency: HARP. Apogee: 123 km (76 mi). 1966 February 18 - . 15:01 GMT - . Launch Site: Barbados Site. Launch Complex: Barbados HARP gun 5 inch. Launch Vehicle: HARP 5-1. 23 - . Nation: Canada. Agency: HARP. Apogee: 54 km (33 mi). 1966 February 20 - . 21:53 GMT - . Launch Site: Barbados Site. Launch Complex: Barbados HARP gun 5 inch. Launch Vehicle: HARP 5-1. 24 - . Nation: Canada. Agency: HARP. Apogee: 61 km (37 mi). 1966 February 20 - . 21:53 GMT - . Launch Site: Barbados Site. Launch Complex: Barbados HARP gun 16 inch. LV Family: Martlet. Launch Vehicle: Martlet 2. 1966 February 23 - . 22:38 GMT - . Launch Site: Barbados Site. Launch Complex: Barbados HARP gun 16 inch. LV Family: Martlet. Launch Vehicle: Martlet 2. 1966 February 23 - . 22:38 GMT - . Launch Site: Barbados Site. Launch Complex: Barbados HARP gun 5 inch. Launch Vehicle: HARP 5-1. 25 - . Nation: Canada. Agency: HARP. Apogee: 66 km (41 mi). 1966 February 24 - . 03:23 GMT - . Launch Site: Barbados Site. Launch Complex: Barbados HARP gun 16 inch. LV Family: Martlet. Launch Vehicle: Martlet 2. 1966 February 24 - . 03:23 GMT - . Launch Site: Barbados Site. Launch Complex: Barbados HARP gun 5 inch. Launch Vehicle: HARP 5-1. 26 - . Nation: Canada. Agency: HARP. Apogee: 56 km (34 mi). 1966 February 24 - . 06:16 GMT - . Launch Site: Barbados Site. Launch Complex: Barbados HARP gun 16 inch. LV Family: Martlet. Launch Vehicle: Martlet 2. 1966 February 24 - . 09:23 GMT - . Launch Site: Barbados Site. Launch Complex: Barbados HARP gun 16 inch. LV Family: Martlet. Launch Vehicle: Martlet 2. B-49 ST THOMAS - . Nation: Canada. Agency: HARP. Apogee: 118 km (73 mi). 1966 February 24 - . 16:00 GMT - . Launch Site: Barbados Site. Launch Complex: Barbados HARP gun 16 inch. LV Family: Martlet. Launch Vehicle: Martlet 2. 1966 February 25 - . 16:00 GMT - . Launch Site: Barbados Site. Launch Complex: Barbados HARP gun 16 inch. LV Family: Martlet. Launch Vehicle: Martlet 2. 1966 February 25 - . 16:06 GMT - . Launch Site: Barbados Site. Launch Complex: Barbados HARP gun 5 inch. Launch Vehicle: HARP 5-1. 27 - . Nation: Canada. Agency: HARP. Apogee: 56 km (34 mi). 1966 March 1 - . 16:30 GMT - . Launch Site: Barbados Site. Launch Complex: Barbados HARP gun 5 inch. Launch Vehicle: HARP 5-1. 28 - . Nation: Canada. Agency: HARP. Apogee: 10 km (6 mi). 1966 March 3 - . 16:00 GMT - . Launch Site: Barbados Site. Launch Complex: Barbados HARP gun 5 inch. Launch Vehicle: HARP 5-1. 29 - . Nation: Canada. Agency: HARP. Apogee: 10 km (6 mi). 1966 March 4 - . 16:08 GMT - . Launch Site: Barbados Site. Launch Complex: Barbados HARP gun 5 inch. Launch Vehicle: HARP 5-1. 30 - . Nation: Canada. Agency: HARP. Apogee: 59 km (36 mi). 1966 March 26 - . 07:07 GMT - . Launch Site: Fort Churchill. LV Family: Black Brant. Launch Vehicle: Black Brant II. Aurora / solar ultraviolet mission - . Nation: Canada. Agency: NRCC. Apogee: 153 km (95 mi). 1966 March 30 - . 04:19 GMT - . Launch Site: Fort Churchill. LV Family: Black Brant. Launch Vehicle: Black Brant II. Aurora / ionosphere / plasma mission - . Nation: Canada. Agency: NRCC. Apogee: 154 km (95 mi). 1966 July 19 - . 05:00 GMT - . Launch Site: Resolute Bay. LV Family: Black Brant. Launch Vehicle: Black Brant III. Ionosphere / solar x-rays mission - . Nation: Canada. Agency: NRCC. Apogee: 150 km (90 mi). 1966 July 21 - . 03:27 GMT - . Launch Site: Resolute Bay. LV Family: Black Brant. Launch Vehicle: Black Brant III. Ionosphere / chemical release mission - . Nation: Canada. Agency: NRCC. Apogee: 150 km (90 mi). 1966 August 16 - . 07:30 GMT - . Launch Site: Fort Churchill. Launch Vehicle: Arcas. Nation: Canada. Agency: MRN. Apogee: 58 km (36 mi). 1966 August 26 - . 20:30 GMT - . Launch Site: Fort Churchill. LV Family: Black Brant. Launch Vehicle: Black Brant III. Test / aeronomy mission - . Nation: Canada. Agency: NRCC. Apogee: 114 km (70 mi). 1966 September - . LV Family: Martlet. Launch Vehicle: Martlet 4. Martlet 4A orbital gun-launched rocket tests. - . Nation: Canada. Development trials for the Martlet 4A began in the fall of 1966 with tests proceeding into early 1967. The majority of the early work was conducted on the Highwater, Quebec test range where the structural integrity of the Martlet 4A motor during gun-launching was proven. Prior to the abrupt end of the HARP project in July 1967, soft recovery trials and flight testing had been planned for the winter of 1967/1968. At nearly one ton the Martlet 4A holds the worlds record for being the largest rocket motor ever fired from a gun. 1966 September 20 - . 00:55 GMT - . Launch Site: Barbados Site. Launch Complex: Barbados HARP gun 16 inch. LV Family: Martlet. Launch Vehicle: Martlet 2. B-51 BETA - . Nation: Canada. Agency: HARP. Apogee: 128 km (79 mi). 1966 September 20 - . 02:24 GMT - . Launch Site: Barbados Site. Launch Complex: Barbados HARP gun 16 inch. LV Family: Martlet. Launch Vehicle: Martlet 2. B-52 GAMMA - . Nation: Canada. Agency: HARP. Apogee: 134 km (83 mi). 1966 September 20 - . 04:10 GMT - . Launch Site: Barbados Site. Launch Complex: Barbados HARP gun 16 inch. LV Family: Martlet. Launch Vehicle: Martlet 2. B-53 DELTA - . Nation: Canada. Agency: HARP. Apogee: 122 km (75 mi). 1966 September 20 - . 06:24 GMT - . Launch Site: Barbados Site. Launch Complex: Barbados HARP gun 16 inch. LV Family: Martlet. Launch Vehicle: Martlet 2. B-55 ZETA - . Nation: Canada. Agency: HARP. Apogee: 117 km (72 mi). 1966 September 20 - . 08:03 GMT - . Launch Site: Barbados Site. Launch Complex: Barbados HARP gun 16 inch. LV Family: Martlet. Launch Vehicle: Martlet 2. B-57 THETA - . Nation: Canada. Agency: HARP. Apogee: 128 km (79 mi). 1966 November 19 - . 00:10 GMT - . Launch Site: Fort Churchill. LV Family: Black Brant. Launch Vehicle: Black Brant II. Hydrogen line emission Aurora / ionosphere / fields mission - . Nation: Canada. Agency: NRCC. Apogee: 144 km (89 mi). 1966 November 29 - . 06:01 GMT - . Launch Site: Fort Churchill. LV Family: Black Brant. Launch Vehicle: Black Brant III. Plasma / fields mission - . Nation: Canada. Agency: NRCC. Apogee: 114 km (70 mi). 1966 November 29 - . 06:08 GMT - . Launch Site: Fort Churchill. LV Family: Black Brant. Launch Vehicle: Black Brant IVA. CR / ne probe Plasma / fields mission - . Nation: Canada. Agency: NRCC. Apogee: 800 km (490 mi). 1966 December 12 - . 19:19 GMT - . Launch Site: Fort Churchill. LV Family: Black Brant. Launch Vehicle: Black Brant III. Neutral density Aeronomy mission - . Nation: Canada. Agency: NRCC. Apogee: 137 km (85 mi). 1966 December 13 - . 08:37 GMT - . Launch Site: Fort Churchill. LV Family: Black Brant. Launch Vehicle: Black Brant VA. FAILURE: Failure. Geminids Aurora / ionosphere / meteorology mission - . Nation: Canada. Agency: NRCC. Apogee: 48 km (29 mi). 1966 December 15 - . 15:32 GMT - . Launch Site: Fort Churchill. LV Family: Black Brant. Launch Vehicle: Black Brant IVA. Test mission - . Nation: Canada. Agency: NRCC. Apogee: 871 km (541 mi). 1966 December 15 - . 21:32 GMT - . Launch Site: Fort Churchill. LV Family: Black Brant. Launch Vehicle: Black Brant IVA. 1967 January 21 - . 06:38 GMT - . Launch Site: Fort Churchill. LV Family: Black Brant. Launch Vehicle: Black Brant II. Aurora / ionosphere / plasma mission - . Nation: Canada. Agency: NRCC. Apogee: 170 km (100 mi). 1967 January 22 - . 18:47 GMT - . Launch Site: Fort Churchill. LV Family: Black Brant. Launch Vehicle: Black Brant II. Aurora / ionosphere / meteorology mission - . Nation: Canada. Agency: NRCC. Apogee: 129 km (80 mi). 1967 February 4 - . 05:21 GMT - . Launch Site: Fort Churchill. LV Family: Black Brant. Launch Vehicle: Black Brant II. Recovery test / Ionosphere Aurora / ionosphere / meteorology mission - . Nation: Canada. Agency: NRCC. Apogee: 183 km (113 mi). 1967 February 16 - . 01:17 GMT - . Launch Site: Barbados Site. Launch Complex: Barbados HARP gun 16 inch. LV Family: Martlet. Launch Vehicle: Martlet 2. B-59 BELFAST - . Nation: Canada. Agency: US Army. Apogee: 123 km (76 mi). 1967 February 16 - . 03:56 GMT - . Launch Site: Barbados Site. Launch Complex: Barbados HARP gun 16 inch. LV Family: Martlet. Launch Vehicle: Martlet 2. B-61 DUBLIN - . Nation: Canada. Agency: US Army. Apogee: 117 km (72 mi). 1967 February 17 - . 02:45 GMT - . Launch Site: Barbados Site. Launch Complex: Barbados HARP gun 16 inch. LV Family: Martlet. Launch Vehicle: Martlet 2. B-63 HOLLYWOOD - . Nation: Canada. Agency: US Army. Apogee: 114 km (70 mi). 1967 February 17 - . 08:17 GMT - . Launch Site: Barbados Site. Launch Complex: Barbados HARP gun 16 inch. LV Family: Martlet. Launch Vehicle: Martlet 2. B-65 LIMERICK - . Nation: Canada. Agency: US Army. Apogee: 110 km (60 mi). 1967 April 26 - . 04:15 GMT - . Launch Site: Fort Churchill. LV Family: Black Brant. Launch Vehicle: Black Brant VB. Test / ionosphere / plasma mission - . Nation: Canada. Agency: NRCC. Apogee: 396 km (246 mi). 1967 April 27 - . 04:10 GMT - . Launch Site: Fort Churchill. LV Family: Black Brant. Launch Vehicle: Black Brant VB. Test / ionosphere / plasma mission - . Nation: Canada. Agency: NRCC. Apogee: 398 km (247 mi). 1967 May 5 - . 04:26 GMT - . Launch Site: Fort Churchill. LV Family: Black Brant. Launch Vehicle: Black Brant VB. Aurora / aeronomy / ionosphere mission - . Nation: Canada. Agency: NRCC. Apogee: 361 km (224 mi). 1967 June 22 - . 02:47 GMT - . Launch Site: Barbados Site. Launch Complex: Barbados HARP gun 16 inch. LV Family: Martlet. Launch Vehicle: Martlet 2. B-67 CAIRO - . Nation: Canada. Agency: BRL. Apogee: 107 km (66 mi). 1967 June 22 - . 23:51 GMT - . Launch Site: Barbados Site. Launch Complex: Barbados HARP gun 16 inch. LV Family: Martlet. Launch Vehicle: Martlet 2. B-68 DURBAN - . Nation: Canada. Agency: BRL. Apogee: 110 km (60 mi). 1967 June 30 - . Launch Vehicle: Martlet. HARP project closed down - . Nation: Canada. The cancellation came only a few months before an orbital 2G-1 could be flown. Martlet 2's were used to conduct extensive research at altitudes of up to 180 km with some 200 flights being conducted between 1963 and 1967. The very low cost per flight, about $3,000, made it ideal for a wide variety of applications.. Typical mission payloads included chemical ejection to produce an observable atmospheric trail and assorted sensors with multi-channel telemetry. 1967 July 4 - . 23:35 GMT - . Launch Site: Fort Churchill. LV Family: Black Brant. Launch Vehicle: Black Brant III. Mass spectrometer Aeronomy mission - . Nation: Canada. Agency: NRCC. Apogee: 131 km (81 mi). 1967 July 5 - . 02:00 GMT - . Launch Site: Fort Churchill. LV Family: Black Brant. Launch Vehicle: Black Brant III. Mass spectrometer Aeronomy mission - . Nation: Canada. Agency: NRCC. Apogee: 151 km (93 mi). 1967 July 12 - . 00:23 GMT - . Launch Site: Fort Churchill. LV Family: Black Brant. Launch Vehicle: Black Brant III. O2 profile Airglow infrared mission - . Nation: Canada. Agency: NRCC. Apogee: 95 km (59 mi). 1967 July 12 - . 11:00 GMT - . Launch Site: Fort Churchill. LV Family: Black Brant. Launch Vehicle: Black Brant III. 1967 September 28 - . 16:35 GMT - . Launch Site: Fort Churchill. LV Family: Black Brant. Launch Vehicle: Black Brant VA.
Test / ionosphere mission - . Nation: Canada. Agency: NRCC. Apogee: 165 km (102 mi). 1967 October 5 - . 04:11 GMT - . Launch Site: Fort Churchill. LV Family: Black Brant. Launch Vehicle: Black Brant VA.
Test / ionosphere mission - . Nation: Canada. Agency: NRCC. Apogee: 182 km (113 mi). 1967 October 20 - . 10:49 GMT - . Launch Site: Resolute Bay. LV Family: Black Brant. Launch Vehicle: Black Brant III. Ionosphere / x-ray astronomy mission - . Nation: Canada. Agency: NRCC. Apogee: 120 km (70 mi). 1967 October 22 - . 09:42 GMT - . Launch Site: Resolute Bay. LV Family: Black Brant. Launch Vehicle: Black Brant III. Ionosphere/Solar X-ray/X-ray Astronomy mission - . Nation: Canada. Agency: NRCC. Apogee: 156 km (96 mi). 1968 January 19 - . 02:24 GMT - . Launch Site: Fort Churchill. LV Family: Black Brant. Launch Vehicle: Black Brant II. Te / ne Aeronomy / ionosphere / Fields mission - . Nation: Canada. Agency: NRCC. Apogee: 142 km (88 mi). 1968 January 22 - . 03:04 GMT - . Launch Site: Fort Churchill. LV Family: Black Brant. Launch Vehicle: Black Brant VB. Hbeta / ne Aurora / ionosphere / plasma mission - . Nation: Canada. Agency: NRCC. Apogee: 377 km (234 mi). 1968 January 23 - . 05:58 GMT - . Launch Site: Fort Churchill. LV Family: Black Brant. Launch Vehicle: Black Brant II. Fields / Ionosphere / Micrometeorites Aurora / ionosphere / fields mission - . Nation: Canada. Agency: NRCC. Apogee: 151 km (93 mi). 1968 January 30 - . 05:03 GMT - . Launch Site: Fort Churchill. LV Family: Black Brant. Launch Vehicle: Black Brant II. Aurora mission - . Nation: Canada. Agency: NRCC. Apogee: 161 km (100 mi). 1968 March 7 - . 22:36 GMT - . Launch Site: Fort Churchill. LV Family: Skua. Launch Vehicle: Skua 2. O2 profile Aeronomy mission - . Nation: Canada. Agency: NRCC. Apogee: 68 km (42 mi). 1968 March 27 - . 04:40 GMT - . Launch Site: Fort Churchill. LV Family: Black Brant. Launch Vehicle: Black Brant VB. Auroral fluxes Aurora / ionosphere / plasma mission - . Nation: Canada. Agency: NRCC. Apogee: 290 km (180 mi). 1968 April 3 - . 13:48 GMT - . Launch Site: Fort Churchill. LV Family: Black Brant. Launch Vehicle: Black Brant VB. Auroral fluxes Aurora / ionosphere / plasma mission - . Nation: Canada. Agency: NRCC. Apogee: 316 km (196 mi). 1968 April 6 - . 02:45 GMT - . Launch Site: Fort Churchill. LV Family: Black Brant. Launch Vehicle: Black Brant IVA. Calgary CR / ionos Ionosphere / chemical release mission - . Nation: Canada. Agency: NRCC. Apogee: 862 km (535 mi). 1968 April 16 - . 03:58 GMT - . Launch Site: Fort Churchill. LV Family: Black Brant. Launch Vehicle: Black Brant II. Auroral breakup Aurora / aeronomy / ionosphere mission - . Nation: Canada. Agency: NRCC. Apogee: 155 km (96 mi). 1968 April 18 - . 05:42 GMT - . Launch Site: Fort Churchill. LV Family: Black Brant. Launch Vehicle: Black Brant II. Auroral breakup Aurora / aeronomy / ionosphere mission - . Nation: Canada. Agency: NRCC. Apogee: 152 km (94 mi). 1968 April 18 - . 06:14 GMT - . Launch Site: Fort Churchill. LV Family: Black Brant. Launch Vehicle: Black Brant II. 1968 April 23 - . 04:47 GMT - . Launch Site: Fort Churchill. LV Family: Black Brant. Launch Vehicle: Black Brant II. FAILURE: Failure. Auroral spectrum Aurora / aeronomy / ionosphere mission - . Nation: Canada. Agency: NRCC. Apogee: 21 km (13 mi). 1968 April 23 - . 04:47 GMT - . Launch Site: Fort Churchill. LV Family: Black Brant. Launch Vehicle: Black Brant II. dup for 116? Aurora / aeronomy / ionosphere mission - . Nation: Canada. Agency: NRCC. Apogee: 337 km (209 mi). 1968 April 29 - . 22:04 GMT - . Launch Site: Fort Churchill. LV Family: Skua. Launch Vehicle: Skua 2. OH profile Aeronomy / Chemical release mission - . Nation: Canada. Apogee: 109 km (67 mi). 1968 April 30 - . 02:00 GMT - . Launch Site: Fort Churchill. LV Family: Skua. Launch Vehicle: Skua 2. Aeronomy / Chemical release mission - . Nation: Canada. Apogee: 72 km (44 mi). 1968 April 30 - . 10:00 GMT - . Launch Site: Fort Churchill. LV Family: Skua. Launch Vehicle: Skua 2. Aeronomy / Chemical release mission - . Nation: Canada. Apogee: 58 km (36 mi). 1968 May 7 - . 05:10 GMT - . Launch Site: Wallops Island. LV Family: Black Brant. Launch Vehicle: Black Brant IVA. Isis test / ionosphere mission - . Nation: Canada. Agency: DRTE, NASA. Apogee: 820 km (500 mi). 1968 August 2 - . 06:19 GMT - . Launch Site: Fort Churchill. LV Family: Black Brant. Launch Vehicle: Black Brant VB. Aeronomy / ionosphere / Fields mission - . Nation: Canada. Agency: NRCC. Apogee: 284 km (176 mi). 1968 August 22 - . 22:30 GMT - . Launch Site: Fort Churchill. Launch Complex: Fort Churchill LC7. Launch Vehicle: Nike. Launcher test - . Nation: Canada. Agency: NRCC. Apogee: 1.00 km (0.60 mi). 1968 October 8 - . 05:07 GMT - . Launch Site: Resolute Bay. LV Family: Black Brant. Launch Vehicle: Black Brant III. X-ray astronomy / ionosphere mission - . Nation: Canada. Agency: NRCC. Apogee: 153 km (95 mi). 1968 October 9 - . 03:20 GMT - . Launch Site: Resolute Bay. LV Family: Black Brant. Launch Vehicle: Black Brant III. Ionosphere / chemical release / solar x-ray mission - . Nation: Canada. Agency: NRCC. Apogee: 120 km (70 mi). 1968 October 31 - . 20:56 GMT - . Launch Site: Fort Churchill. LV Family: Black Brant. Launch Vehicle: Black Brant III. PCA Ionos Aeronomy / ionosphere mission - . Nation: Canada. Agency: NRCC. Apogee: 140 km (80 mi). 1968 November 1 - . 03:31 GMT - . Launch Site: Fort Churchill. LV Family: Black Brant. Launch Vehicle: Black Brant III. PCA Ionos Aeronomy / ionosphere / plasma mission - . Nation: Canada. Agency: NRCC. Apogee: 138 km (85 mi). 1968 November 19 - . 04:29 GMT - . Launch Site: Fort Churchill. LV Family: Black Brant. Launch Vehicle: Black Brant III. FAILURE: Failure. Ionosphere / plasma mission - . Nation: Canada. Agency: NRCC. Apogee: 288 km (178 mi). 1968 December 13 - . 09:45 GMT - . Launch Site: Fort Churchill. Launch Complex: Fort Churchill LC7. LV Family: Black Brant. Launch Vehicle: Black Brant II. Geminids Ionosphere / meteorites mission - . Nation: Canada. Agency: NRCC. Apogee: 143 km (88 mi). 1968 December 18 - . 11:38 GMT - . Launch Site: Fort Churchill. LV Family: Black Brant. Launch Vehicle: Black Brant VB. Calgary auroral Aurora / ionosphere mission Aurora / ionosphere mission - . Nation: Canada. Agency: NRCC. Apogee: 363 km (225 mi). 1969 January 14 - . 05:25 GMT - . Launch Site: Fort Churchill. LV Family: Black Brant. Launch Vehicle: Black Brant IVA. FAILURE: Failure. Aeronomy / plasma mission - . Nation: Canada. Agency: NRCC. Apogee: 99 km (61 mi). 1969 January 28 - . 07:16 GMT - . Launch Site: Fort Churchill. LV Family: Black Brant. Launch Vehicle: Black Brant II. N2, temperature profile Aeronomy mission - . Nation: Canada. Agency: NRCC. Apogee: 149 km (92 mi). 1969 January 30 - . 06:46 GMT - . Launch Site: Vandenberg. Launch Complex: Vandenberg SLC2E. LV Family: Thor. Launch Vehicle: Thor Delta E1. Isis 1 - . Payload: Isis A. Mass: 241 kg (531 lb). Nation: Canada. Agency: CRCSS. Class: Earth. Type: Magnetosphere satellite. Spacecraft: Isis. USAF Sat Cat: 3669 . COSPAR: 1969-009A. Apogee: 3,458 km (2,148 mi). Perigee: 578 km (359 mi). Inclination: 88.40 deg. Period: 127.60 min. Ionospheric measurements; data correlated with measurements from Alouette 1. Spacecraft engaged in research and exploration of the upper atmosphere or outer space (US Cat B). .
1969 February 13 - . 23:11 GMT - . Launch Site: Wallops Island. LV Family: Black Brant. Launch Vehicle: Black Brant II. Aeronomy mission - . Nation: Canada. Agency: NRCC. Apogee: 265 km (164 mi). 1969 February 19 - . 04:17 GMT - . Launch Site: Fort Churchill. LV Family: Black Brant. Launch Vehicle: Black Brant II. VUV auroral spectrum Aurora mission - . Nation: Canada. Agency: NRCC. Apogee: 124 km (77 mi). 1969 March 6 - . 06:14 GMT - . Launch Site: Fort Churchill. LV Family: Black Brant. Launch Vehicle: Black Brant IVA. Ionosphere / plasma mission - . Nation: Canada. Agency: NRCC. Apogee: 791 km (491 mi). 1969 March 10 - . 04:40 GMT - . Launch Site: Fort Churchill. LV Family: Black Brant. Launch Vehicle: Black Brant VB. Aurora / ionosphere / solar mission - . Nation: Canada. Agency: NRCC. Apogee: 362 km (224 mi). 1969 March 11 - . 03:33 GMT - . Launch Site: Fort Churchill. LV Family: Black Brant. Launch Vehicle: Black Brant VB. Aurora / aeronomy / ionosphere mission - . Nation: Canada. Agency: NRCC. Apogee: 141 km (87 mi). 1969 March 29 - . 00:41 GMT - . Launch Site: Fort Churchill. LV Family: Black Brant. Launch Vehicle: Black Brant III. O2 infrared profile Aurora mission - . Nation: Canada. Agency: NRCC. Apogee: 108 km (67 mi). 1969 March 29 - . 11:58 GMT - . Launch Site: Fort Churchill. LV Family: Black Brant. Launch Vehicle: Black Brant III. O2 infrared profile Aurora mission - . Nation: Canada. Agency: NRCC. Apogee: 114 km (70 mi). 1969 April 1 - . 04:38 GMT - . Launch Site: Fort Churchill. LV Family: Black Brant. Launch Vehicle: Black Brant VB. VUV auroral Aurora mission - . Nation: Canada. Agency: NRCC. Apogee: 372 km (231 mi). 1969 April 12 - . 19:00 GMT - . Launch Site: Fort Churchill. LV Family: Black Brant. Launch Vehicle: Black Brant III. FAILURE: Failure. Ionosphere mission - . Nation: Canada. Agency: NRCC. Apogee: 26 km (16 mi). 1969 April 19 - . 00:10 GMT - . Launch Site: Fort Churchill. LV Family: Arcas. Launch Vehicle: Boosted Arcas 2. O / OH profile Aeronomy mission - . Nation: Canada. Apogee: 104 km (64 mi). 1969 April 19 - . 01:17 GMT - . Launch Site: Fort Churchill. LV Family: Arcas. Launch Vehicle: Boosted Arcas 2. O / OH profile Aeronomy mission - . Nation: Canada. Apogee: 103 km (64 mi). 1969 April 19 - . 04:09 GMT - . Launch Site: Fort Churchill. LV Family: Arcas. Launch Vehicle: Boosted Arcas 2. FAILURE: Failure. O / OH profile Aeronomy mission - . Nation: Canada. Apogee: 55 km (34 mi). 1969 May 1 - . 20:00 GMT - . Launch Site: Fort Churchill. LV Family: Black Brant. Launch Vehicle: Black Brant IVA. Electron content Ionosphere mission - . Nation: Canada. Agency: NRCC. Apogee: 760 km (470 mi). 1969 May 7 - . 14:00 GMT - . Launch Site: Fort Churchill. LV Family: Black Brant. Launch Vehicle: Black Brant IVA. Electron content Ionosphere mission - . Nation: Canada. Agency: NRCC. Apogee: 820 km (500 mi). 1969 September 11 - . 01:07 GMT - . Launch Site: Fort Churchill. LV Family: Black Brant. Launch Vehicle: Black Brant II. Aeronomy / ionosphere / meteorites mission - . Nation: Canada. Agency: NRCC. Apogee: 137 km (85 mi). 1969 September 12 - . 01:02 GMT - . Launch Site: Fort Churchill. LV Family: Black Brant. Launch Vehicle: Black Brant II. Aeronomy / ionosphere / meteorites mission - . Nation: Canada. Agency: NRCC. Apogee: 138 km (85 mi). 1969 October 25 - . 06:00 GMT - . Launch Site: Resolute Bay. LV Family: Black Brant. Launch Vehicle: Black Brant IIIB. Soft X-ray survey X-ray astronomy mission - . Nation: Canada. Agency: NRCC. Apogee: 192 km (119 mi). 1969 October 26 - . 06:40 GMT - . Launch Site: Resolute Bay. LV Family: Black Brant. Launch Vehicle: Black Brant IIIB. Soft X-ray survey X-ray astronomy mission - . Nation: Canada. Agency: NRCC. Apogee: 197 km (122 mi). 1969 November 3 - . 10:28 GMT - . Launch Site: Resolute Bay. LV Family: Black Brant. Launch Vehicle: Black Brant IIIB. Aurora / chemical release mission - . Nation: Canada. Agency: NRCC. Apogee: 200 km (120 mi). 1969 November 5 - . 11:18 GMT - . Launch Site: Resolute Bay. LV Family: Black Brant. Launch Vehicle: Black Brant IIIB. 1969 December 3 - . 18:42 GMT - . Launch Site: Fort Churchill. LV Family: Black Brant. Launch Vehicle: Black Brant III. Aeronomy mission - . Nation: Canada. Agency: NRCC. Apogee: 120 km (70 mi). 1969 December 3 - . 23:12 GMT - . Launch Site: Fort Churchill. LV Family: Black Brant. Launch Vehicle: Black Brant III. Aeronomy mission - . Nation: Canada. Agency: NRCC. Apogee: 117 km (72 mi). 1969 December 15 - . 02:27 GMT - . Launch Site: Fort Churchill. LV Family: Black Brant. Launch Vehicle: Black Brant IVA. Auroral particles Aurora / ionosphere mission Aurora / ionosphere mission - . Nation: Canada. Agency: NRCC. Apogee: 774 km (480 mi). 1970 January 6 - . Birth of David Saint-Jacques - . Nation: Canada. Related Persons: Saint-Jacques. Canadian physicist mission specialist astronaut, 2009-on. 1 spaceflight, 94.5 days in space. Flew to orbit on Soyuz MS-11 (2018)..
1970 January 14 - . 04:41 GMT - . Launch Site: Fort Churchill. LV Family: Black Brant. Launch Vehicle: Black Brant VB. Auroral lower elevatuib Ionosphere / plasma / meteor mission - . Nation: Canada. Agency: NRCC. Apogee: 128 km (79 mi). 1970 February 24 - . 07:19 GMT - . Launch Site: Fort Churchill. LV Family: Black Brant. Launch Vehicle: Black Brant IVA. VLF / Particles Ionosphere / plasma mission - . Nation: Canada. Agency: NRCC. Apogee: 796 km (494 mi). 1970 March 7 - . 17:40 GMT - . Launch Site: East Quoddy. LV Family: Black Brant. Launch Vehicle: Black Brant III. Eclipse solar ultraviolet and x-rays mission - . Nation: Canada. Agency: NRCC. Apogee: 152 km (94 mi). 1970 March 7 - . 18:55 GMT - . Launch Site: East Quoddy. LV Family: Black Brant. Launch Vehicle: Black Brant III. Eclipse solar ultraviolet and x-rays mission - . Nation: Canada. Agency: NRCC. Apogee: 156 km (96 mi). 1970 March 7 - . 18:57 GMT - . Launch Site: East Quoddy. LV Family: Black Brant. Launch Vehicle: Black Brant III. 1970 March 7 - . 19:03 GMT - . Launch Site: East Quoddy. LV Family: Black Brant. Launch Vehicle: Black Brant III. 1970 April 22 - . 08:11 GMT - . Launch Site: Fort Churchill. LV Family: Black Brant. Launch Vehicle: Black Brant II. FAILURE: Failure. Aeronomy / ionosphere mission - . Nation: Canada. Agency: NRCC. Apogee: 75 km (46 mi). 1970 April 24 - . 00:52 GMT - . Launch Site: Fort Churchill. LV Family: Black Brant. Launch Vehicle: Black Brant VB. Aurora / ionosphere mission Aurora / ionosphere mission - . Nation: Canada. Agency: NRCC. Apogee: 288 km (178 mi). 1970 August 16 - . 03:56 GMT - . Launch Site: Fort Churchill. LV Family: Black Brant. Launch Vehicle: Black Brant VB. E fields Ionosphere mission - . Nation: Canada. Agency: NRCC. Apogee: 260 km (160 mi). 1970 November 13 - . 21:27 GMT - . Launch Site: Fort Churchill. LV Family: Skua. Launch Vehicle: Skua 2. D-region O profile Aeronomy mission - . Nation: Canada. Agency: NRCC. Apogee: 98 km (60 mi). 1970 December 7 - . 21:34 GMT - . Launch Site: Natal. LV Family: Black Brant. Launch Vehicle: Black Brant IVA. Twilight airglow Aeronomy / x-ray astronomy mission - . Nation: Canada. Agency: NRCC. Apogee: 770 km (470 mi). 1970 December 14 - . 10:02 GMT - . Launch Site: Fort Churchill. LV Family: Black Brant. Launch Vehicle: Black Brant VB. Geminids Ionosphere / meteorites mission - . Nation: Canada. Agency: NRCC. Apogee: 340 km (210 mi). 1970 December 15 - . 19:40 GMT - . Launch Site: Fort Churchill. LV Family: Black Brant. Launch Vehicle: Black Brant VII. MDSS-001 test - . Nation: Canada. Agency: Bristol. Apogee: 30 km (18 mi). 1970 December 16 - . 15:44 GMT - . Launch Site: Fort Churchill. LV Family: Black Brant. Launch Vehicle: Black Brant VII. MDSS-002 test - . Nation: Canada. Agency: Bristol. Apogee: 30 km (18 mi). 1970 December 16 - . 17:15 GMT - . Launch Site: Fort Churchill. LV Family: Black Brant. Launch Vehicle: Black Brant VII. MDSS-003 test - . Nation: Canada. Agency: Bristol. Apogee: 30 km (18 mi). 1970 December 16 - . 20:26 GMT - . Launch Site: Fort Churchill. LV Family: Black Brant. Launch Vehicle: Black Brant VII. MDSS-004 test - . Nation: Canada. Agency: Bristol. Apogee: 30 km (18 mi). 1971 January 13 - . 20:10 GMT - . Launch Site: Fort Churchill. LV Family: Black Brant. Launch Vehicle: Black Brant II. O2 profile Aeronomy mission - . Nation: Canada. Agency: NRCC. Apogee: 146 km (90 mi). 1971 January 21 - . 02:32 GMT - . Launch Site: Fort Churchill. LV Family: Black Brant. Launch Vehicle: Black Brant VB. Auroral Aurora / ionosphere / plasma mission - . Nation: Canada. Agency: NRCC. Apogee: 258 km (160 mi). 1971 January 23 - . 04:44 GMT - . Launch Site: Fort Churchill. LV Family: Black Brant. Launch Vehicle: Black Brant VB. Auroral VUV Aurora / ionosphere / plasma mission - . Nation: Canada. Agency: NRCC. Apogee: 375 km (233 mi). 1971 January 26 - . 17:23 GMT - . Launch Site: Fort Churchill. LV Family: Black Brant. Launch Vehicle: Black Brant VB. Airglow Ionosphere / solar mission - . Nation: Canada. Agency: NRCC. Apogee: 282 km (175 mi). 1971 February 5 - . 22:46 GMT - . Launch Site: Fort Churchill. LV Family: Black Brant. Launch Vehicle: Black Brant IVB. Impedance dipole Aurora / ionosphere / meteorology mission - . Nation: Canada. Agency: NRCC. Apogee: 784 km (487 mi). 1971 February 20 - . 03:23 GMT - . Launch Site: Fort Churchill. LV Family: Black Brant. Launch Vehicle: Black Brant IVA. Auroral emissions Aurora / ionosphere / plasma mission - . Nation: Canada. Agency: NRCC. Apogee: 785 km (487 mi). 1971 February 28 - . 07:53 GMT - . Launch Site: Fort Churchill. LV Family: Black Brant. Launch Vehicle: Black Brant III. Microwave background Submillimeter radio astronomy mission - . Nation: Canada. Agency: NRCC. Apogee: 152 km (94 mi). 1971 March 3 - . 06:52 GMT - . Launch Site: Fort Churchill. LV Family: Black Brant. Launch Vehicle: Black Brant VB. Electrons / ions Aurora mission - . Nation: Canada. Agency: NRCC. Apogee: 275 km (170 mi). 1971 March 20 - . 07:53 GMT - . Launch Site: Fort Churchill. LV Family: Black Brant. Launch Vehicle: Black Brant II. Auroral VUV Test / aurora / ionosphere mission - . Nation: Canada. Agency: NRCC. Apogee: 151 km (93 mi). 1971 April 1 - . 02:57 GMT - . Launch Site: Vandenberg. Launch Complex: Vandenberg SLC2E. LV Family: Thor. Launch Vehicle: Thor Delta E1. Isis 2 - . Payload: Isis B. Mass: 264 kg (582 lb). Nation: Canada. Agency: CRCSS. Class: Earth. Type: Magnetosphere satellite. Spacecraft: Isis. USAF Sat Cat: 5104 . COSPAR: 1971-024A. Apogee: 1,424 km (884 mi). Perigee: 1,358 km (843 mi). Inclination: 88.20 deg. Period: 113.60 min. Ionospheric research. Spacecraft engaged in research and exploration of the upper atmosphere or outer space (US Cat B). .
1971 April 26 - . 15:35 GMT - . Launch Site: Fort Churchill. LV Family: Black Brant. Launch Vehicle: Black Brant VII. F-EXM-006 test - . Nation: Canada. Agency: Bristol. Apogee: 29 km (18 mi). 1971 April 26 - . 17:02 GMT - . Launch Site: Fort Churchill. LV Family: Black Brant. Launch Vehicle: Black Brant VII. F-EXM-005 test - . Nation: Canada. Agency: Bristol. Apogee: 29 km (18 mi). 1971 April 26 - . 18:06 GMT - . Launch Site: Fort Churchill. LV Family: Black Brant. Launch Vehicle: Black Brant VII. F-EXM-008 test - . Nation: Canada. Agency: Bristol. Apogee: 37 km (22 mi). 1971 April 26 - . 19:33 GMT - . Launch Site: Fort Churchill. LV Family: Black Brant. Launch Vehicle: Black Brant VII. F-EXM-009 test - . Nation: Canada. Agency: Bristol. Apogee: 36 km (22 mi). 1971 April 26 - . 20:44 GMT - . Launch Site: Fort Churchill. LV Family: Black Brant. Launch Vehicle: Black Brant VII. F-EXM-007 test - . Nation: Canada. Agency: Bristol. Apogee: 32 km (19 mi). 1971 May 5 - . 14:43 GMT - . Launch Site: Fort Churchill. LV Family: Black Brant. Launch Vehicle: Black Brant VII. F-EXM-010 test - . Nation: Canada. Agency: Bristol. Apogee: 38 km (23 mi). 1971 May 5 - . 15:46 GMT - . Launch Site: Fort Churchill. LV Family: Black Brant. Launch Vehicle: Black Brant VII. F-EXM-011 test - . Nation: Canada. Agency: Bristol. Apogee: 36 km (22 mi). 1971 May 5 - . 16:45 GMT - . Launch Site: Fort Churchill. LV Family: Black Brant. Launch Vehicle: Black Brant VII. F-EXM-012 test - . Nation: Canada. Agency: Bristol. Apogee: 38 km (23 mi). 1971 May 5 - . 17:17 GMT - . Launch Site: Fort Churchill. LV Family: Black Brant. Launch Vehicle: Black Brant VII. F-EXM-013 test - . Nation: Canada. Agency: Bristol. Apogee: 34 km (21 mi). 1971 May 5 - . 18:25 GMT - . Launch Site: Fort Churchill. LV Family: Black Brant. Launch Vehicle: Black Brant VII. F-EXM-014 test - . Nation: Canada. Agency: Bristol. Apogee: 35 km (21 mi). 1971 May 5 - . 18:56 GMT - . Launch Site: Fort Churchill. LV Family: Black Brant. Launch Vehicle: Black Brant VII. F-EXM-015 test - . Nation: Canada. Agency: Bristol. Apogee: 35 km (21 mi). 1971 May 5 - . 19:24 GMT - . Launch Site: Fort Churchill. LV Family: Black Brant. Launch Vehicle: Black Brant VII. F-EXM-016 test - . Nation: Canada. Agency: Bristol. Apogee: 35 km (21 mi). 1972 January 15 - . 05:37 GMT - . Launch Site: Gillam. LV Family: Black Brant. Launch Vehicle: Black Brant IIIB. Auroral mission - . Nation: Canada. Agency: NRCC. Apogee: 190 km (110 mi). 1972 January 15 - . 06:01 GMT - . Launch Site: Fort Churchill. LV Family: Black Brant. Launch Vehicle: Black Brant VB. Not in FC Aeronomy / plasma mission - . Nation: Canada. Agency: NRCC. Apogee: 300 km (180 mi). 1972 January 15 - . 06:04 GMT - . Launch Site: Fort Churchill. LV Family: Black Brant. Launch Vehicle: Black Brant IVB. Not in FC Ionosphere mission - . Nation: Canada. Agency: NRCC. Apogee: 800 km (490 mi). 1972 January 15 - . 23:59 GMT - . Launch Site: Fort Churchill. LV Family: Arcas. Launch Vehicle: Boosted Arcas. ATT-BA-4 Auroral mission - . Nation: Canada. Agency: NASA, NRCC. Apogee: 53 km (32 mi). 1972 January 27 - . 15:39 GMT - . Launch Site: Fort Churchill. LV Family: Black Brant. Launch Vehicle: Black Brant VII. F-EXM-064 test - . Nation: Canada. Agency: Bristol. Apogee: 38 km (23 mi). 1972 January 27 - . 18:32 GMT - . Launch Site: Fort Churchill. LV Family: Black Brant. Launch Vehicle: Black Brant VII. F-EXM-065 test - . Nation: Canada. Agency: Bristol. Apogee: 34 km (21 mi). 1972 January 27 - . 19:36 GMT - . Launch Site: Fort Churchill. LV Family: Black Brant. Launch Vehicle: Black Brant VII. F-EXM-056 test - . Nation: Canada. Agency: Bristol. Apogee: 34 km (21 mi). 1972 January 27 - . 21:48 GMT - . Launch Site: Fort Churchill. LV Family: Black Brant. Launch Vehicle: Black Brant VII. F-EXM-052 test - . Nation: Canada. Agency: Bristol. Apogee: 40 km (24 mi). 1972 February 8 - . 09:45 GMT - . Launch Site: Fort Churchill. LV Family: Black Brant. Launch Vehicle: Black Brant III. Infrared airglow profile Aeronomy / ionosphere / infrared astronomy mission - . Nation: Canada. Agency: NRCC. Apogee: 121 km (75 mi). 1972 February 14 - . Launch Site: Fort Churchill. LV Family: Black Brant. Launch Vehicle: Black Brant VB. Not in FC - . Nation: Canada. Agency: NRCC. Apogee: 309 km (192 mi). 1972 February 15 - . 03:48 GMT - . Launch Site: Fort Churchill. LV Family: Black Brant. Launch Vehicle: Black Brant II. Auroral VUV Aurora / ionosphere mission Aurora / ionosphere mission - . Nation: Canada. Agency: NRCC. Apogee: 133 km (82 mi). 1972 March 21 - . 08:37 GMT - . Launch Site: Fort Churchill. LV Family: Black Brant. Launch Vehicle: Black Brant III. Oxygen recombination Aeronomy mission - . Nation: Canada. Agency: NRCC. Apogee: 119 km (73 mi). 1972 March 24 - . 09:44 GMT - . Launch Site: Fort Churchill. LV Family: Black Brant. Launch Vehicle: Black Brant VB. Nightglow Aeronomy / ionosphere mission - . Nation: Canada. Agency: NRCC. Apogee: 193 km (119 mi). 1972 May 17 - . 07:00 GMT - . Launch Site: Fort Churchill. LV Family: Black Brant. Launch Vehicle: Black Brant IVB. X-ray survey X-ray astronomy mission - . Nation: Canada. Agency: NRCC. Apogee: 660 km (410 mi). 1972 July 10 - . 11:00 GMT - . Launch Site: Fort Churchill. LV Family: Black Brant. Launch Vehicle: Black Brant III. Aeronomy / Solar Eclipse mission - . Nation: Canada. Agency: NRCC. Apogee: 106 km (65 mi). 1972 July 10 - . 19:19 GMT - . Launch Site: Fort Churchill. LV Family: Black Brant. Launch Vehicle: Black Brant III. Aeronomy / Solar Eclipse mission - . Nation: Canada. Agency: NRCC. Apogee: 115 km (71 mi). 1972 July 10 - . 19:50 GMT - . Launch Site: Fort Churchill. LV Family: Black Brant. Launch Vehicle: Black Brant III. Aeronomy / Solar Eclipse mission - . Nation: Canada. Agency: NRCC. Apogee: 166 km (103 mi). 1972 July 10 - . 20:26 GMT - . Launch Site: Fort Churchill. LV Family: Black Brant. Launch Vehicle: Black Brant III. Aeronomy / Solar Eclipse mission - . Nation: Canada. Agency: NRCC. Apogee: 103 km (64 mi). 1972 July 10 - . 20:29 GMT - . Launch Site: East Quoddy. LV Family: Black Brant. Launch Vehicle: Black Brant III. Solar ultraviolet and x-ray mission - . Nation: Canada. Agency: NRCC. Apogee: 143 km (88 mi). 1972 July 10 - . 21:32 GMT - . Launch Site: East Quoddy. LV Family: Black Brant. Launch Vehicle: Black Brant III. Solar ultraviolet and x-ray mission - . Nation: Canada. Agency: NRCC. Apogee: 148 km (91 mi). 1972 July 10 - . 21:39 GMT - . Launch Site: East Quoddy. LV Family: Black Brant. Launch Vehicle: Black Brant III. Solar ultraviolet and x-ray mission - . Nation: Canada. Agency: NRCC. Apogee: 144 km (89 mi). 1972 July 10 - . 21:41 GMT - . Launch Site: East Quoddy. LV Family: Black Brant. Launch Vehicle: Black Brant III. Solar ultraviolet and x-ray mission - . Nation: Canada. Agency: NRCC. Apogee: 152 km (94 mi). 1972 July 12 - . 19:07 GMT - . Launch Site: Fort Churchill. LV Family: Black Brant. Launch Vehicle: Black Brant VI. MDSS FP-019 test - . Nation: Canada. Agency: Bristol. Apogee: 71 km (44 mi). 1972 July 12 - . 20:52 GMT - . Launch Site: Fort Churchill. LV Family: Black Brant. Launch Vehicle: Black Brant VI. MDSS FP-020 test - . Nation: Canada. Agency: Bristol. Apogee: 72 km (44 mi). 1972 July 12 - . 22:30 GMT - . Launch Site: Fort Churchill. LV Family: Black Brant. Launch Vehicle: Black Brant VI. FAILURE: Failure. MDSS FP-022 test - . Nation: Canada. Agency: Bristol. Apogee: 14 km (8 mi). 1972 July 12 - . 23:35 GMT - . Launch Site: Fort Churchill. LV Family: Black Brant. Launch Vehicle: Black Brant VI. MDSS FP-021 test - . Nation: Canada. Agency: Bristol. Apogee: 67 km (41 mi). 1972 July 13 - . 00:13 GMT - . Launch Site: Fort Churchill. LV Family: Black Brant. Launch Vehicle: Black Brant VI. FAILURE: Failure. MDSS FP-023 test - . Nation: Canada. Agency: Bristol. Apogee: 7.00 km (4.30 mi). 1972 July 13 - . 00:46 GMT - . Launch Site: Fort Churchill. LV Family: Black Brant. Launch Vehicle: Black Brant VI. MDSS FP-025 test - . Nation: Canada. Agency: Bristol. Apogee: 77 km (47 mi). 1972 July 13 - . 18:54 GMT - . Launch Site: Fort Churchill. LV Family: Black Brant. Launch Vehicle: Black Brant VI. FAILURE: Failure. MDSS FP-028 test - . Nation: Canada. Agency: Bristol. Apogee: 16 km (9 mi). 1972 July 13 - . 19:52 GMT - . Launch Site: Fort Churchill. LV Family: Black Brant. Launch Vehicle: Black Brant VI. MDSS FP-029 test - . Nation: Canada. Agency: Bristol. Apogee: 73 km (45 mi). 1972 July 13 - . 21:34 GMT - . Launch Site: Fort Churchill. LV Family: Black Brant. Launch Vehicle: Black Brant VI. MDSS FP-027 test - . Nation: Canada. Agency: Bristol. Apogee: 76 km (47 mi). 1972 July 13 - . 23:30 GMT - . Launch Site: Fort Churchill. LV Family: Black Brant. Launch Vehicle: Black Brant VI. MDSS FP-026 test - . Nation: Canada. Agency: Bristol. Apogee: 74 km (45 mi). 1972 July 14 - . 14:53 GMT - . Launch Site: Fort Churchill. LV Family: Black Brant. Launch Vehicle: Black Brant VI. MDSS FP-024 test - . Nation: Canada. Agency: Bristol. Apogee: 78 km (48 mi). 1972 December 1 - . 01:23 GMT - . Launch Site: Fort Churchill. LV Family: Black Brant. Launch Vehicle: Black Brant IIIB. Microwave background Submillimeter radio astronomy mission - . Nation: Canada. Agency: NRCC. Apogee: 185 km (114 mi). 1973 January 29 - . 05:02 GMT - . Launch Site: Fort Churchill. LV Family: Black Brant. Launch Vehicle: Black Brant IVB. Aurora mission - . Nation: Canada. Agency: NRCC. Apogee: 760 km (470 mi). 1973 February 2 - . 06:15 GMT - . Launch Site: Gillam. LV Family: Black Brant. Launch Vehicle: Black Brant IIIB. Auroral mission - . Nation: Canada. Agency: NRCC. Apogee: 200 km (120 mi). 1973 February 2 - . 06:20 GMT - . Launch Site: Fort Churchill. LV Family: Black Brant. Launch Vehicle: Black Brant VB. Auroral substorm Aurora / aeronomy / plasma mission - . Nation: Canada. Agency: NRCC. Apogee: 335 km (208 mi). 1973 February 9 - . 02:53 GMT - . Launch Site: Fort Churchill. LV Family: Black Brant. Launch Vehicle: Black Brant IVB. Aeronomy / plasma / aurora mission - . Nation: Canada. Agency: NRCC. Apogee: 760 km (470 mi). 1973 February 22 - . 03:49 GMT - . Launch Site: Fort Churchill. LV Family: Black Brant. Launch Vehicle: Black Brant IIIB. Auroral plasma Aeronomy mission - . Nation: Canada. Agency: NRCC. Apogee: 207 km (128 mi). 1973 February 24 - . 07:20 GMT - . Launch Site: Fort Churchill. LV Family: Black Brant. Launch Vehicle: Black Brant IIIB. Auroral plasma Aeronomy mission - . Nation: Canada. Agency: NRCC. Apogee: 190 km (110 mi). 1973 February 26 - . 03:23 GMT - . Launch Site: Fort Churchill. LV Family: Black Brant. Launch Vehicle: Black Brant II. Auroral VUV Aurora / aeronomy / ionosphere mission - . Nation: Canada. Agency: NRCC. Apogee: 132 km (82 mi). 1973 May 16 - . 09:19 GMT - . Launch Site: Fort Churchill. LV Family: Black Brant. Launch Vehicle: Black Brant VB. Tower modification test / aeronomy / ionosphere / solar mission - . Nation: Canada. Agency: NRCC. Apogee: 301 km (187 mi). 1973 May 16 - . 11:06 GMT - . Launch Site: Fort Churchill. LV Family: Black Brant. Launch Vehicle: Black Brant VI. Dust collector Aeronomy mission - . Nation: Canada. Agency: NRCC. Apogee: 78 km (48 mi). 1973 June 21 - . 10:30 GMT - . Launch Site: Barking Sands. LV Family: Black Brant. Launch Vehicle: Black Brant IVB. Galactic X-rays X-ray astronomy mission - . Nation: Canada. Agency: NRCC. Apogee: 686 km (426 mi). 1973 November 25 - . 22:47 GMT - . Launch Site: Fort Churchill. LV Family: Black Brant. Launch Vehicle: Black Brant VA. FAILURE: Failure. Auroral mission - . Nation: Canada. Agency: NRCC. Apogee: 103 km (64 mi). 1973 December 4 - . 13:45 GMT - . Launch Site: Fort Churchill. LV Family: Skua. Launch Vehicle: Skua 2. Oxygen profile Aeronomy mission - . Nation: Canada. Agency: NRCC. Apogee: 124 km (77 mi). 1973 December 4 - . 18:00 GMT - . Launch Site: Fort Churchill. LV Family: Skua. Launch Vehicle: Skua 2. Aeronomy mission - . Nation: Canada. Agency: NRCC. Apogee: 108 km (67 mi). 1973 December 4 - . 22:34 GMT - . Launch Site: Fort Churchill. LV Family: Skua. Launch Vehicle: Skua 2. 1973 December 5 - . 06:52 GMT - . Launch Site: Fort Churchill. LV Family: Skua. Launch Vehicle: Skua 2. Aeronomy mission - . Nation: Canada. Agency: NRCC. Apogee: 110 km (60 mi). 1973 December 5 - . 14:05 GMT - . Launch Site: Fort Churchill. LV Family: Skua. Launch Vehicle: Skua 2. 1974 January 23 - . 06:06 GMT - . Launch Site: Fort Churchill. LV Family: Black Brant. Launch Vehicle: Black Brant VB. Aurora / aeronomy / ionosphere mission - . Nation: Canada. Agency: NRCC. Apogee: 208 km (129 mi). 1974 February 13 - . 22:01 GMT - . Launch Site: Fort Churchill. LV Family: Black Brant. Launch Vehicle: Black Brant IVB. Aurora / ionosphere / fields mission - . Nation: Canada. Agency: NRCC. Apogee: 638 km (396 mi). 1974 February 22 - . 04:59 GMT - . Launch Site: Fort Churchill. LV Family: Black Brant. Launch Vehicle: Black Brant II. Auroral VUV Aurora / aeronomy / ionosphere mission - . Nation: Canada. Agency: NRCC. Apogee: 131 km (81 mi). 1974 February 28 - . 02:53 GMT - . Launch Site: Fort Churchill. LV Family: Black Brant. Launch Vehicle: Black Brant VB. ISIS-2 pass Aurora mission - . Nation: Canada. Agency: NRCC. Apogee: 246 km (152 mi). 1974 March 22 - . 16:56 GMT - . Launch Site: Fort Churchill. LV Family: Black Brant. Launch Vehicle: Black Brant VI. FAILURE: Failure. 1974 March 26 - . 21:30 GMT - . Launch Site: Fort Churchill. LV Family: Black Brant. Launch Vehicle: Black Brant VI. Dust collector Aeronomy mission - . Nation: Canada. Agency: NRCC. Apogee: 81 km (50 mi). 1974 March 29 - . 02:00 GMT - . Launch Site: Chilca. LV Family: Black Brant. Launch Vehicle: Black Brant IVB. EQUION Ionosphere / eclipse mission - . Nation: Canada. Agency: Aerospace. Apogee: 742 km (461 mi). 1974 April 23 - . 04:31 GMT - . Launch Site: Fort Churchill. LV Family: Black Brant. Launch Vehicle: Black Brant VI. Auroral X-rays Aurora mission - . Nation: Canada. Agency: NRCC. Apogee: 76 km (47 mi). 1974 December 6 - . 23:32 GMT - . Launch Site: Cape Parry. LV Family: Black Brant. Launch Vehicle: Black Brant VB. Cusp Auroral mission - . Nation: Canada. Agency: NRCC. Apogee: 245 km (152 mi). 1974 December 11 - . 22:48 GMT - . Launch Site: Cape Parry. LV Family: Black Brant. Launch Vehicle: Black Brant IVB. Aurora / ionosphere mission Aurora / ionosphere mission - . Nation: Canada. Agency: NRCC. Apogee: 600 km (370 mi). 1975 January 11 - . 00:32 GMT - . Launch Site: Cape Parry. LV Family: Black Brant. Launch Vehicle: Black Brant IVB. Periquito Plasma / barium release mission - . Nation: Canada. Agency: Sandia. Apogee: 540 km (330 mi). 1975 January 30 - . 02:15 GMT - . Launch Site: Fort Churchill. LV Family: Black Brant. Launch Vehicle: Black Brant VB. Auroral/Aeronomy mission - . Nation: Canada. Agency: NRCC. Apogee: 244 km (151 mi). 1975 October 31 - . 07:12 GMT - . Launch Site: Fort Churchill. LV Family: Black Brant. Launch Vehicle: Black Brant VI. Not in FC Aurora mission - . Nation: Canada. Agency: NRCC. Apogee: 61 km (37 mi). 1975 December 4 - . Launch Site: Fort Churchill. LV Family: Black Brant. Launch Vehicle: Black Brant 8B. Test mission - . Nation: Canada. Agency: Bristol. Apogee: 340 km (210 mi). 1976 January 27 - . Birth of Jeremy Roger Hansen - . Nation: Canada. Related Persons: Hansen, Jeremy. Canadian pilot mission specialist astronaut, 2009-on..
1976 February 2 - . 02:08 GMT - . Launch Site: Fort Churchill. LV Family: Black Brant. Launch Vehicle: Black Brant VB. FAILURE: Failure. Aurora / ionosphere mission Aurora / ionosphere mission - . Nation: Canada. Agency: NRCC. Apogee: 55 km (34 mi). 1976 February 5 - . 05:22 GMT - . Launch Site: Fort Churchill. LV Family: Black Brant. Launch Vehicle: Black Brant IVB. Test / aurora / ionosphere mission - . Nation: Canada. Agency: NRCC. Apogee: 730 km (450 mi). 1976 May 11 - . 15:49 GMT - . Launch Site: Fort Churchill. LV Family: Black Brant. Launch Vehicle: Black Brant VI. Sep system test - . Nation: Canada. Agency: NRCC. Apogee: 60 km (37 mi). 1976 November 9 - . 12:32 GMT - . Launch Site: Woomera. LV Family: Black Brant. Launch Vehicle: Black Brant VB. Cosmic rays X-ray astronomy mission - . Nation: Canada. Agency: NRCC. Apogee: 215 km (133 mi). 1977 January 7 - . 07:45 GMT - . Launch Site: Fort Churchill. LV Family: Black Brant. Launch Vehicle: Black Brant VB. Aurora / aeronomy mission - . Nation: Canada. Agency: NRCC. Apogee: 261 km (162 mi). 1977 January 13 - . 04:22 GMT - . Launch Site: Fort Churchill. LV Family: Black Brant. Launch Vehicle: Black Brant VA.
Auroral UV / infrared Aurora / ionosphere mission Aurora / ionosphere mission - . Nation: Canada. Agency: NRCC. Apogee: 152 km (94 mi). 1977 February 27 - . 05:20 GMT - . Launch Site: Fort Churchill. LV Family: Black Brant. Launch Vehicle: Black Brant VI. Non-acoustic waves Aeronomy mission - . Nation: Canada. Agency: NRCC. Apogee: 95 km (59 mi). 1977 March 5 - . 04:47 GMT - . Launch Site: Fort Churchill. LV Family: Black Brant. Launch Vehicle: Black Brant VI. Auroral X-rays Aurora mission - . Nation: Canada. Agency: NRCC. Apogee: 60 km (37 mi). 1977 March 5 - . 04:47 GMT - . Launch Site: Fort Churchill. LV Family: Black Brant. Launch Vehicle: Black Brant 8B. Auroral Aurora / ionosphere / fields mission - . Nation: Canada. Agency: NRCC. Apogee: 327 km (203 mi). 1977 March 8 - . 04:01 GMT - . Launch Site: Fort Churchill. LV Family: Black Brant. Launch Vehicle: Black Brant IVB. Pitch angles Test / aurora / ionosphere mission - . Nation: Canada. Agency: NRCC. Apogee: 700 km (430 mi). 1977 March 8 - . 04:06 GMT - . Launch Site: Fort Churchill. LV Family: Black Brant. Launch Vehicle: Black Brant VI. 1977 March 21 - . 06:22 GMT - . Launch Site: Fort Churchill. LV Family: Black Brant. Launch Vehicle: Black Brant VB. CMB spectrum Submillimeter radio astronomy mission - . Nation: Canada. Agency: NRCC. Apogee: 178 km (110 mi). 1977 December 6 - . 00:05 GMT - . Launch Site: Cape Parry. LV Family: Black Brant. Launch Vehicle: Black Brant 8B. Dayside Cusp Ionosphere mission - . Nation: Canada. Agency: NRCC. Apogee: 300 km (180 mi). 1977 December 12 - . 23:00 GMT - . Launch Site: Cape Parry. LV Family: Black Brant. Launch Vehicle: Black Brant 8B. FAILURE: Failure. Dayside Cusp Aurora / ionosphere / fields mission - . Nation: Canada. Agency: NRCC. Apogee: 10 km (6 mi). 1978 February 8 - . 04:23 GMT - . Launch Site: Fort Churchill. LV Family: Black Brant. Launch Vehicle: Black Brant VI. Coherent pulse radar Ionosphere mission - . Nation: Canada. Agency: NRCC. Apogee: 95 km (59 mi). 1978 February 27 - . 05:30 GMT - . Launch Site: Fort Churchill. LV Family: Black Brant. Launch Vehicle: Black Brant IVB. Aurora / ionosphere mission Aurora / ionosphere mission - . Nation: Canada. Agency: NRCC. Apogee: 785 km (487 mi). 1978 February 27 - . 05:32 GMT - . Launch Site: Fort Churchill. LV Family: Black Brant. Launch Vehicle: Black Brant VI. Auroral X-rays Aurora mission - . Nation: Canada. Agency: NRCC. Apogee: 55 km (34 mi). 1978 February 28 - . 03:09 GMT - . Launch Site: Fort Churchill. LV Family: Black Brant. Launch Vehicle: Black Brant VI. Auroral X-rays Aurora mission - . Nation: Canada. Agency: NRCC. Apogee: 57 km (35 mi). 1978 April 12 - . 01:43 GMT - . Launch Site: Fort Churchill. LV Family: Black Brant. Launch Vehicle: Black Brant VA.
O / Ozone profile Aurora mission - . Nation: Canada. Agency: NRCC. Apogee: 140 km (80 mi). 1978 April 18 - . 19:18 GMT - . Launch Site: Fort Churchill. LV Family: Black Brant. Launch Vehicle: Black Brant VI. Dust collector Meteorites mission - . Nation: Canada. Agency: NRCC. Apogee: 75 km (46 mi). 1978 November 25 - . 04:44 GMT - . Launch Site: Fort Churchill. LV Family: Black Brant. Launch Vehicle: Black Brant 8B. CMB spectrum 2 Submillimeter radio astronomy mission - . Nation: Canada. Agency: NRCC. Apogee: 366 km (227 mi). 1978 December 15 - . 01:57 GMT - . Launch Site: Fort Churchill. LV Family: Black Brant. Launch Vehicle: Black Brant VB. Auroral mission - . Nation: Canada. Agency: NRCC. Apogee: 316 km (196 mi). DRIMS - . Mass: 900 kg (1,980 lb). Nation: Canada. Agency: NASA Greenbelt. Program: Anik. Decay Date: 1979-04-23 . USAF Sat Cat: 11154 . COSPAR: 1978-116B. Apogee: 1,832 km (1,138 mi). Perigee: 181 km (112 mi). Inclination: 28.30 deg. Period: 105.26 min. First use of the Delta Redundant Inertial Measurement System (DRIMS). DRIMS improved the inertial measurement unit introduced with DIGS, but kept the DIGS guidance computer. DRIMS added redundancy on all axes of motion. The Delta upper stage was tracked as a separate functional object with this designation on this launch. 1979 February 19 - . 20:38 GMT - . Launch Site: Red Lake. Launch Complex: Red Lake MCM. Launch Vehicle: Super Loki. Eclipse pre Sonde - . Nation: Canada. Agency: NRCC. Apogee: 80 km (49 mi). 1979 February 23 - . 18:00 GMT - . Launch Site: Red Lake. Launch Complex: Red Lake MCM. Launch Vehicle: Super Loki. 1979 February 24 - . 15:51 GMT - . Launch Site: Red Lake. Launch Complex: Red Lake MCM. Launch Vehicle: Super Loki. 1979 February 24 - . 17:22 GMT - . Launch Site: Red Lake. Launch Complex: Red Lake CHK. LV Family: Arcas. Launch Vehicle: Super Arcas. Eclipse preparatory aeronomy mission - . Nation: Canada. Agency: NRCC. Apogee: 80 km (49 mi). Eclipse Prep. 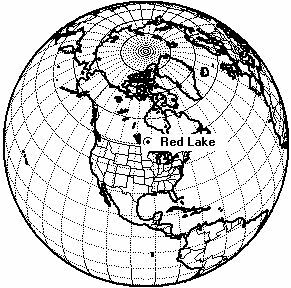 Launched from Red Lake, Chukuni Range, Ontario, Canada - Latitude: 50.88 N, Longitude:93.47 W..
1979 February 25 - . 17:00 GMT - . Launch Site: Red Lake. Launch Complex: Red Lake MCM. LV Family: Arcas. Launch Vehicle: Super Arcas. Eclipse Ne - . Nation: Canada. Agency: NRCC. Apogee: 80 km (49 mi). 1979 February 25 - . 17:30 GMT - . Launch Site: Red Lake. Launch Complex: Red Lake CHK. LV Family: Arcas. Launch Vehicle: Super Arcas. 1979 February 25 - . 18:30 GMT - . Launch Site: Red Lake. Launch Complex: Red Lake MCM. Launch Vehicle: Super Loki. Eclipse Sonde - . Nation: Canada. Agency: NRCC. Apogee: 80 km (49 mi). 1979 February 26 - . Launch Site: Red Lake. Launch Complex: Red Lake CHK. LV Family: Black Brant. Launch Vehicle: Black Brant VA.
Eclipse mission - . Nation: Canada. Agency: NRCC. Apogee: 132 km (82 mi). 1979 February 26 - . 16:53 GMT - . Launch Site: Red Lake. Launch Complex: Red Lake CHK. LV Family: Arcas. Launch Vehicle: Super Arcas. Eclipse Aeronomy mission - . Nation: Canada. Agency: NRCC. Apogee: 80 km (49 mi). Eclipse. Launched from Red Lake, Chukuni Range, Ontario, Canada - Latitude: 50.88 N, Longitude:93.47 W..
1979 February 26 - . 17:38 GMT - . Launch Site: Red Lake. Launch Complex: Red Lake CHK. LV Family: Arcas. Launch Vehicle: Super Arcas. 1979 February 26 - . 18:40 GMT - . Launch Site: Red Lake. Launch Complex: Red Lake MCM. LV Family: Arcas. Launch Vehicle: Super Arcas. 1979 February 26 - . 19:15 GMT - . Launch Site: Red Lake. Launch Complex: Red Lake MCM. Launch Vehicle: Super Loki. 1979 February 27 - . 03:30 GMT - . Launch Site: Red Lake. Launch Complex: Red Lake CHK. LV Family: Arcas. Launch Vehicle: Super Arcas. Aeronomy mission - . Nation: Canada. Agency: NRCC. Apogee: 80 km (49 mi). 1979 February 27 - . 04:40 GMT - . Launch Site: Red Lake. Launch Complex: Red Lake CHK. Launch Vehicle: Super Loki. Aeronomy mission - . Nation: Canada. Agency: NRCC. Apogee: 75 km (46 mi). 1979 February 27 - . 05:30 GMT - . Launch Site: Red Lake. Launch Complex: Red Lake CHK. Launch Vehicle: Super Loki. Eclipse Met Probe - . Nation: Canada. Agency: NRCC. Apogee: 75 km (46 mi). 1979 February 27 - . 13:06 GMT - . Launch Site: Red Lake. Launch Complex: Red Lake CHK. LV Family: Arcas. Launch Vehicle: Super Arcas. 1979 February 27 - . 14:10 GMT - . Launch Site: Red Lake. Launch Complex: Red Lake MCM. LV Family: Arcas. Launch Vehicle: Super Arcas. 1979 February 27 - . 14:40 GMT - . Launch Site: Red Lake. Launch Complex: Red Lake CHK. Launch Vehicle: Super Loki. 1979 February 27 - . 15:45 GMT - . Launch Site: Red Lake. Launch Complex: Red Lake CHK. Launch Vehicle: Super Loki. Eclipse Met Probe - . Nation: Canada. Agency: NRCC. Apogee: 80 km (49 mi). 1979 April 27 - . 06:09 GMT - . Launch Site: Fort Churchill. LV Family: Black Brant. Launch Vehicle: Black Brant VI. FAILURE: Failure. Auroral X-rays Aurora mission - . Nation: Canada. Agency: NRCC. Apogee: 50 km (31 mi). 1979 April 28 - . 06:44 GMT - . Launch Site: Fort Churchill. LV Family: Black Brant. Launch Vehicle: Black Brant VI. 1979 December 3 - . 05:32 GMT - . Launch Site: Fort Churchill. LV Family: Black Brant. Launch Vehicle: Black Brant 8B. Auroral substorm Aurora / ionosphere mission Aurora / ionosphere mission - . Nation: Canada. Agency: NRCC. Apogee: 344 km (213 mi). 1979 December 17 - . 06:27 GMT - . Launch Site: Fort Churchill. LV Family: Black Brant. Launch Vehicle: Black Brant VA.
Aurora mission - . Nation: Canada. Agency: NRCC. Apogee: 138 km (85 mi). 1980 February 15 - . 11:43 GMT - . Launch Site: Southend. LV Family: Black Brant. Launch Vehicle: Black Brant VB. Pulsating aurora Aurora mission - . Nation: Canada. Agency: NRCC. Apogee: 156 km (96 mi). 1980 February 23 - . 10:05 GMT - . Launch Site: Southend. LV Family: Black Brant. Launch Vehicle: Black Brant VB. Pulsating aurora Aurora mission - . Nation: Canada. Agency: NRCC. Apogee: 148 km (91 mi). 1980 April 6 - . 03:33 GMT - . Launch Site: Fort Churchill. LV Family: Black Brant. Launch Vehicle: Black Brant 8B. Waterhole 1 Aurora / aeronomy / ionosphere mission - . Nation: Canada. Agency: NRCC. Apogee: 317 km (196 mi). 1981 January 19 - . 03:37 GMT - . Launch Site: Fort Churchill. LV Family: Black Brant. Launch Vehicle: Black Brant VB. Upper atmosphere Composition Aeronomy mission - . Nation: Canada. Agency: NRCC. Apogee: 263 km (163 mi). 1981 January 26 - . 07:20 GMT - . Launch Site: Fort Churchill. LV Family: Black Brant. Launch Vehicle: Black Brant IVB. Substorm Auroral mission - . Nation: Canada. Agency: NRCC. Apogee: 584 km (362 mi). 1981 March 28 - . 01:54 GMT - . Launch Site: Fort Churchill. LV Family: Black Brant. Launch Vehicle: Black Brant IVB. FALCONS Ionosphere / plasma / fields mission - . Nation: Canada. Agency: NRCC. Apogee: 675 km (419 mi). 1981 March 28 - . 01:54 GMT - . Launch Site: Fort Churchill. LV Family: Black Brant. Launch Vehicle: Black Brant VB. FALCONS Ionosphere / plasma / fields mission - . Nation: Canada. Agency: NRCC. Apogee: 327 km (203 mi). 1981 December 6 - . 23:14 GMT - . Launch Site: Cape Parry. LV Family: Black Brant. Launch Vehicle: Black Brant IVB. CENTAUR Auroral mission - . Nation: Canada. Agency: NRCC. Apogee: 615 km (382 mi). 1981 December 13 - . 21:31 GMT - . Launch Site: Cape Parry. LV Family: Black Brant. Launch Vehicle: Black Brant IVB. FAILURE: Failure. CENTAUR Auroral mission - . Nation: Canada. Agency: NRCC. Apogee: 50 km (31 mi). 1982 September 15 - . 18:15 GMT - . Launch Site: White Sands. Launch Complex: White Sands LC36. LV Family: Black Brant. Launch Vehicle: Black Brant VC. Solar infrared mission - . Nation: Canada. Agency: NRCC. Apogee: 243 km (150 mi). 1983 February 7 - . 02:14 GMT - . Launch Site: Fort Churchill. LV Family: Black Brant. Launch Vehicle: Black Brant IX. WATERHOLE 3 Plasma mission - . Nation: Canada. Agency: NRCC. Apogee: 333 km (206 mi). 1983 May 12 - . 05:46 GMT - . Launch Site: Fort Churchill. LV Family: Black Brant. Launch Vehicle: Black Brant 8B. SABRE Aurora / ionosphere / release mission - . Nation: Canada. Agency: NRCC. Apogee: 350 km (210 mi). 1983 June 11 - . 08:10 GMT - . Launch Site: White Sands. Launch Complex: White Sands LC36. LV Family: Black Brant. Launch Vehicle: Black Brant VC. OASIS Aeronomy mission - . Nation: Canada. Agency: NRCC. Apogee: 180 km (110 mi). 1984 February 28 - . 03:53 GMT - . Launch Site: Fort Churchill. LV Family: Black Brant. Launch Vehicle: Black Brant 8C. ARIES B Aurora / aeronomy / ionosphere mission - . Nation: Canada. Agency: NRCC. Apogee: 204 km (126 mi). 1984 March 3 - . 03:06 GMT - . Launch Site: Fort Churchill. LV Family: Black Brant. Launch Vehicle: Black Brant 8C. ARIES A Aurora / aeronomy / ionosphere mission - . Nation: Canada. Agency: NRCC. Apogee: 206 km (128 mi). 1984 May 11 - . 11:22 GMT - . Launch Site: Fort Churchill. LV Family: Black Brant. Launch Vehicle: Black Brant III. SMERF 1 Aeronomy mission - . Nation: Canada. Agency: NRCC. Apogee: 103 km (64 mi). 1985 February 15 - . 01:45 GMT - . Launch Site: Fort Churchill. LV Family: Black Brant. Launch Vehicle: Black Brant IXB. WATERHOLE 4 Aurora / aeronomy / ionosphere mission - . Nation: Canada. Agency: NRCC. Apogee: 302 km (187 mi). 1985 February 15 - . 05:25 GMT - . Launch Site: Fort Churchill. LV Family: Black Brant. Launch Vehicle: Black Brant XB. MARIE Ionosphere / plasma / fields mission - . Nation: Canada. Agency: NRCC. Apogee: 979 km (608 mi). 1985 May 6 - . 22:45 GMT - . Launch Site: Fort Churchill. LV Family: Black Brant. Launch Vehicle: Black Brant IIIB. SMERF 2 (Ozone) Aeronomy mission - . Nation: Canada. Agency: NRCC. Apogee: 114 km (70 mi). 1989 January 30 - . 21:14 GMT - . Launch Site: Andoya. LV Family: Black Brant. Launch Vehicle: Black Brant XB. OEDIPUS A Plasma / tether mission - . Nation: Canada. Agency: CSA. Apogee: 512 km (318 mi). 1990 January 21 - . 06:05 GMT - . Launch Site: White Sands. LV Family: Black Brant. Launch Vehicle: Black Brant 8C. COBRA Submillimeter radio astronomy mission - . Nation: Canada. Agency: CSA. Apogee: 250 km (150 mi). 1992 March 19 - . 16:05 GMT - . Launch Site: White Sands. Launch Complex: White Sands LC36. LV Family: Black Brant. Launch Vehicle: Black Brant IX. CSAR 1 Microgravity mission - . Nation: Canada. Agency: CSA. Apogee: 226 km (140 mi). 1992 March 19 - . 16:10 GMT - . Launch Site: White Sands. Launch Complex: White Sands LC36. LV Family: Black Brant. Launch Vehicle: Black Brant IX. HIRAAS 2 Airglow mission - . Nation: Canada. Agency: NASA. Apogee: 300 km (180 mi). CTA - . Payload: Columbia F13 / Lageos 2 [Iris] / CTA. Mass: 82 kg (180 lb). Nation: Canada. Agency: CSA. Program: STS. Class: Technology. Type: Navigation technology satellite. Spacecraft: CTA. Decay Date: 1992-11-01 . USAF Sat Cat: 22214 . COSPAR: 1992-070C. Apogee: 219 km (136 mi). Perigee: 212 km (131 mi). Inclination: 28.50 deg. Period: 88.80 min. Canadian Target Assembly; deployed from STS-52 10/22/92. .
1994 February 10 - . 05:35 GMT - . Launch Site: White Sands. LV Family: Black Brant. Launch Vehicle: Black Brant 9CM1. Gemini Plasma / aeronomy mission - . Nation: Canada. Agency: CSA, NASA. Apogee: 245 km (152 mi). 1994 December 8 - . Launch Site: White Sands. Launch Complex: White Sands LC36. Launch Pad: LC36 L-455. LV Family: Black Brant. Launch Vehicle: Black Brant 9CM1. CSAR-2 Microgravity mission - . Nation: Canada. Agency: CSA. Apogee: 254 km (157 mi). CSAR II (Canadian materials processing payload). 1995 November 4 - . 14:22 GMT - . Launch Site: Vandenberg. Launch Complex: Vandenberg SLC2W. LV Family: Thor. Launch Vehicle: Delta 7920-10. Radarsat - . Mass: 2,713 kg (5,981 lb). Nation: Canada. Agency: CSA. Class: Earth. Type: Civilian Radarsat. Spacecraft Bus: BCP-4000. Spacecraft: Radarsat. USAF Sat Cat: 23710 . COSPAR: 1995-059A. Apogee: 793 km (492 mi). Perigee: 791 km (491 mi). Inclination: 98.60 deg. Period: 100.70 min. Earth imaging with synthetic aperture radar..
1995 November 7 - . 06:38 GMT - . Launch Site: Poker Flat. LV Family: Black Brant. Launch Vehicle: Black Brant XII. OEDIPUS C Ionosphere / tether mission - . Nation: Canada. Agency: CSA, NASA. Apogee: 824 km (512 mi). 1996 June 13 - . Launch Site: Barking Sands. LV Family: Black Brant. Launch Vehicle: Black Brant VC. LAADEX Target - . Nation: Canada. Agency: USN. Type: ABM Target. Apogee: 180 km (110 mi). 1998 April 28 - . 12:10 GMT - . Launch Site: Fort Churchill. LV Family: Black Brant. Launch Vehicle: Black Brant IXB. ACTIVE Ionosphere mission - . Nation: Canada. Agency: CSA. Apogee: 315 km (195 mi). 1999 January 15 - . Wild Fire engine test. - . Nation: Canada. Program: X-Prize. The da Vinci Project (Toronto, Ontario, Canada) successfully tests single engine propulsion system..
2000 February 26 - . 09:19 GMT - . Launch Site: Poker Flat. Launch Complex: Poker Flat LC4. LV Family: Black Brant. Launch Vehicle: Black Brant XII. GEODESIC Ionosphere mission - . Nation: Canada. Agency: CSA. Apogee: 990 km (610 mi). 2002 April 25 - . Canadian Arrow mock-up displayed. - . Nation: Canada. Program: X-Prize. Spacecraft Bus: X-Prize. Spacecraft: Canadian Arrow. Canadian Arrow (London, Ontario, Canada) displays full-scale rocket mock-up in New York City's Rockefeller Center..
2002 July 20 - . Canadian Arrow injector tests. - . Nation: Canada. Program: X-Prize. Spacecraft Bus: X-Prize. Spacecraft: Canadian Arrow. Canadian Arrow (London, Ontario, Canada) successfully hot fire tests first stage propulsion system injector cup. 2002 October 5 - . Canadian Arrow test stand completed. - . Nation: Canada. Program: X-Prize. Spacecraft Bus: X-Prize. Spacecraft: Canadian Arrow. Canadian Arrow (London, Ontario, Canada) rocket engine test stand complete.. Most - . Mass: 66 kg (145 lb). Nation: Canada. Agency: CSA. Class: Astronomy. Type: Astroseismology satellite. Spacecraft: Most. USAF Sat Cat: 27843 . COSPAR: 2003-031D. Apogee: 834 km (518 mi). Perigee: 818 km (508 mi). Inclination: 98.70 deg. Period: 101.40 min. MOST (Microvariability and Oscillations of Stars) was a Canadian Space Agency project with a 0.15m telescope which would make photometric observations of stars down to mag 6 with 1 part per million accuracy in the 3500-7000 Angstrom band. Canada's tiny "humble space telescope", celebrated its tenth anniversary of operations in 2013. CanX-1 - . Mass: 1.00 kg (2.20 lb). Nation: Canada. Agency: Toronto. Class: Technology. Type: Navigation technology satellite. Spacecraft: Cubesat. USAF Sat Cat: 27847 . COSPAR: 2003-031H. Apogee: 831 km (516 mi). Perigee: 817 km (507 mi). Inclination: 98.70 deg. Period: 101.40 min. 1U cubesat from the University of Toronto, carried a camera for attitude determination. Failed. No signal from spacecraft..
2004 July 16 - . Launch Site: Barking Sands. LV Family: Oriole. Launch Vehicle: ARAV-ER. 3-stage ARAV - . Nation: Canada. Agency: USN. Apogee: 200 km (120 mi). 2005 July 7 - . 16:20 GMT - . Launch Site: White Sands. LV Family: Black Brant. Launch Vehicle: Black Brant IX. VAULT 3 Solar ultraviolet mission - . Nation: Canada. Agency: NASA Greenbelt. Apogee: 300 km (180 mi). 2005 August 3 - . 18:45 GMT - . Launch Site: White Sands. LV Family: Black Brant. Launch Vehicle: Black Brant IX. USC-6 (SOHO SEM) Solar extreme ultraviolet mission - . Nation: Canada. Agency: NASA Greenbelt. Apogee: 300 km (180 mi). 2007 October 30 - . 04:12 GMT - . Launch Site: Wallops Island. LV Family: Black Brant. Launch Vehicle: Black Brant IX. MidLat Spread F Plasma mission - . Nation: Canada. Agency: NASA Greenbelt. Apogee: 395 km (245 mi). 2007 November 6 - . 18:00 GMT - . Launch Site: White Sands. LV Family: Black Brant. Launch Vehicle: Black Brant IX. EUNIS Solar extreme ultraviolet mission - . Nation: Canada. Agency: NASA Greenbelt. Apogee: 300 km (180 mi). 2007 December 10 - . 09:00 GMT - . Launch Site: Andoya. Launch Complex: Andoya U3. LV Family: Black Brant. Launch Vehicle: Black Brant XII. TRICE High Plasma mission - . Nation: Canada. Agency: NASA. Apogee: 1,150 km (710 mi). 2007 December 10 - . 09:02 GMT - . Launch Site: Andoya. Launch Complex: Andoya Athena. LV Family: Black Brant. Launch Vehicle: Black Brant XII. TRICE Low Plasma mission - . Nation: Canada. Agency: NASA. Apogee: 675 km (419 mi). 2007 December 14 - . 13:17 GMT - . Launch Site: Baikonur. Launch Complex: Baikonur LC31. LV Family: R-7. Launch Vehicle: Soyuz-FG. Radarsat-2 - . Mass: 2,200 kg (4,800 lb). Nation: Canada. Agency: Starsem. Class: Surveillance. Type: Civilian Radarsat. Spacecraft Bus: BCP-4000. Spacecraft: Radarsat. USAF Sat Cat: 32382 . COSPAR: 2007-061A. Apogee: 793 km (492 mi). Perigee: 791 km (491 mi). Inclination: 98.60 deg. Period: 100.70 min. Follow-on to Canadian Radarsat-1 launched in 1995. Designed to provide C-band synthetic aperture radar mapping with resolution of 3 m to Canadian government users. Compared to the earlier model had greater resolution, vastly increased on-board data storage capacity, and capability to scan left or right of ground track. Planned lifetime of seven years. 2008 September 19 - . 21:48 GMT - . Launch Site: Baikonur. Launch Complex: Baikonur LC200/39. LV Family: Proton. Launch Vehicle: Proton-M/Briz-M.
Nimiq 4 - . Payload: Eurostar 3000S. Mass: 4,800 kg (10,500 lb). Nation: Canada. Agency: ILS. Program: Anik. Class: Communications. Type: Civilian communications satellite. Spacecraft: Eurostar 3000. USAF Sat Cat: 33373 . COSPAR: 2008-044A. Apogee: 35,749 km (22,213 mi). Perigee: 35,653 km (22,153 mi). Inclination: 0.10 deg. Period: 1,431.70 min. Geostationary television broadcasting satellite launched for Telesat..
2008 December 10 - . 13:43 GMT - . Launch Site: Baikonur. LV Family: Proton. Launch Vehicle: Proton-M/Briz-M.
Ciel-2 - . Payload: Spacebus 4000C4. Mass: 5,600 kg (12,300 lb). Nation: Canada. Agency: ILS. Class: Communications. Type: Military communications satellite. Spacecraft: Spacebus 4000. USAF Sat Cat: 33453 . COSPAR: 2008-063A. Apogee: 35,793 km (22,240 mi). Perigee: 35,779 km (22,231 mi). Inclination: 0.10 deg. Period: 1,436.10 min. Communications satellite owned by Ciel Satellite Group, Ottawa and controlled from Saskatoon, Canada. Ciel was at the time using Echostar V (redesignated Ciel-1)..
2009 February 26 - . 18:30 GMT - . Launch Site: Baikonur. Launch Complex: Baikonur LC45/1. LV Family: Zenit. Launch Vehicle: Zenit-3SLB. Telstar 11N - . Mass: 4,012 kg (8,844 lb). Nation: Canada. Agency: SIS. Program: Telstar series. Class: Communications. Type: Civilian communications satellite. Spacecraft: FS-1300. USAF Sat Cat: 34111 . COSPAR: 2009-009A. Apogee: 35,798 km (22,243 mi). Perigee: 35,776 km (22,230 mi). Inclination: 0.00 deg. Period: 1,436.10 min. Ku-band direct-broadcast satellite with 39 high-power transponders covering North and Central America, Europe, Africa and the Atlantic Ocean Region, stationed at 37.5 degrees..
2012 May 17 - . 19:12 GMT - . Launch Site: Baikonur. Launch Complex: Baikonur LC81/24. LV Family: Proton. Launch Vehicle: Proton-M/Briz-M.
Nimiq 6 - . Mass: 4,500 kg (9,900 lb). Nation: Canada. Class: Communications. Type: Communications satellite. Spacecraft: FS-1300. USAF Sat Cat: 38342 . COSPAR: 2012-026A. Apogee: 35,429 km (22,014 mi). Perigee: 35,379 km (21,983 mi). Inclination: 0.00 deg. Period: 1,416.60 min. Canadian television broadcast satellite with 24 Ku-band transponders..
2012 July 22 - . 06:41 GMT - . Launch Site: Baikonur. Launch Complex: Baikonur LC31. LV Family: R-7. Launch Vehicle: Soyuz-FG. ExactView-1 - . Mass: 100 kg (220 lb). Nation: Canada. Agency: ExactView. Manufacturer: Surrey. Class: Communications. Type: Civilian communications satellite. Spacecraft: MicroSat-100. USAF Sat Cat: 38709 . COSPAR: 2012-039C. Apogee: 822 km (510 mi). Perigee: 805 km (500 mi). Inclination: 98.90 deg. Period: 101.20 min. Carried Automatic Identification System (AIS) for the identification and location of maritime vessels..
2013 February 25 - . 12:31 GMT - . Launch Site: Vandenberg. Launch Complex: Vandenberg SLC3E. Launch Vehicle: PSLV. Sapphire - . Mass: 150 kg (330 lb). Nation: Canada. Agency: DND. Manufacturer: Surrey. Class: Surveillance. Type: Orbital object tracking satellite. Spacecraft: SSTL-150. USAF Sat Cat: 39088 . COSPAR: 2013-009C. Apogee: 787 km (489 mi). Perigee: 772 km (479 mi). Inclination: 98.63 deg. Period: 100.44 min. Canadian Forces satellite for space object surveillance and missile early warning, based with a 0.15m visible-light telescope..
2013 April 15 - . 18:36 GMT - . Launch Site: Baikonur. Launch Complex: Baikonur LC200/39. Launch Pad: LC200/39. LV Family: Proton. Launch Vehicle: Proton-M/Briz-M.
Anik G-1 - . Mass: 4,905 kg (10,813 lb). Nation: Canada. Class: Communications. Type: Communications satellite. Spacecraft: FS-1300. USAF Sat Cat: 39127 . COSPAR: 2013-014A. Apogee: 35,788 km (22,237 mi). Perigee: 35,785 km (22,235 mi). Inclination: 0.0100 deg. Period: 1,436.11 min. Carried Ku, C and X-band communications payloads for Telesat..
2014 June 19 - . 19:11 GMT - . Launch Site: Dombarovskiy. LV Family: R-36M. Launch Vehicle: Dnepr. Brite Toronto - . Mass: 10 kg (22 lb). Nation: Canada. Spacecraft: Toronto GNB. USAF Sat Cat: 40020 . COSPAR: 2014-033L. Apogee: 739 km (459 mi). Perigee: 613 km (380 mi). Inclination: 97.96 deg. Period: 98.27 min. BRIght-star Target Explorer to observe the brightest starts for variability..
2017 January 27 - . 13:45 GMT - . Launch Site: Poker Flat. Launch Vehicle: Black Brant 9. PolarNOx - . Nation: Canada. Apogee: 283 km (175 mi). Atmospheric science mission. Impacted in Poker Flat zone 4..
2017 February 22 - . 10:14 GMT - . Launch Site: Poker Flat. Launch Vehicle: Black Brant 9. ISINGLASS-1 - . Nation: Canada. Apogee: 362 km (224 mi). Auroral mission. Impacted in Poker Flat zone 4..
2017 March 2 - . 05:41 GMT - . Launch Site: Poker Flat. Launch Vehicle: Black Brant 9. NASA 36.301GE - . Nation: Canada. Apogee: 330 km (200 mi). Auroral mission. Impacted in Poker Flat zone 4..
NASA 36.306GE - . Nation: Canada. Apogee: 190 km (110 mi). Auroral mission. Impacted in Poker Flat zone 4..
ISINGLASS-2 - . Nation: Canada. Apogee: 365 km (226 mi). Auroral mission. Impacted in Poker Flat zone 4..
2017 April 18 - . 15:10 GMT - . Launch Platform: ISS. LV Family: Atlas V. Launch Vehicle: Atlas V 401. Ex-Alta 1 - . Payload: QB50-CA03; EXALTA-1. Nation: Canada. Spacecraft: Cubesat. USAF Sat Cat: 42734 . COSPAR: 1998-067MP. Apogee: 153 km (95 mi). Perigee: 150 km (90 mi). Inclination: 51.61 deg. Period: 87.52 min. See Ex-Alta 1 (QB50 CA03) ↑. Part of the QB50 international network of 50 CubeSats for measurements in the lower thermosphere..
2018 January 19 - . 04:11 GMT - . Launch Site: Jiuquan. Launch Complex: Jiuquan SLS-E. LV Family: DF-31. Launch Vehicle: Chang Zheng 11. KIPP - . Payload: Kepler-0; KEPLER-0 (KIPP). Nation: Canada. USAF Sat Cat: 43157 . COSPAR: 2018-008C. Apogee: 548 km (340 mi). Perigee: 524 km (325 mi). Inclination: 97.51 deg. Period: 95.36 min. See KIPP. ..
2018 January 19 - . 12:17 GMT - . Launch Site: Poker Flat. LV Family: Black Brant. Launch Vehicle: Black Brant IX. DXL-3 - . Nation: Canada. Apogee: 230 km (140 mi). X-ray Astronomy mission. Impacted Alaska..
2018 January 26 - . 14:11 GMT - . Launch Site: Poker Flat. LV Family: Hawk. Launch Vehicle: Terrier Improved Orion. Super Soaker 1 - . Nation: Canada. Apogee: 160 km (90 mi). Aeronomy mission. Impacted Alaska..
2018 January 26 - . 14:58 GMT - . Launch Site: Poker Flat. LV Family: Hawk. Launch Vehicle: Terrier Improved Orion. Super Soaker 2 - . Nation: Canada. Apogee: 100 km (60 mi). Aeronomy mission. Impacted Alaska..
2018 January 26 - . 14:59 GMT - . Launch Site: Poker Flat. LV Family: Hawk. Launch Vehicle: Terrier Improved Orion. Super Soaker 3 - . Nation: Canada. Apogee: 160 km (90 mi). Aeronomy mission. Impacted Alaska..